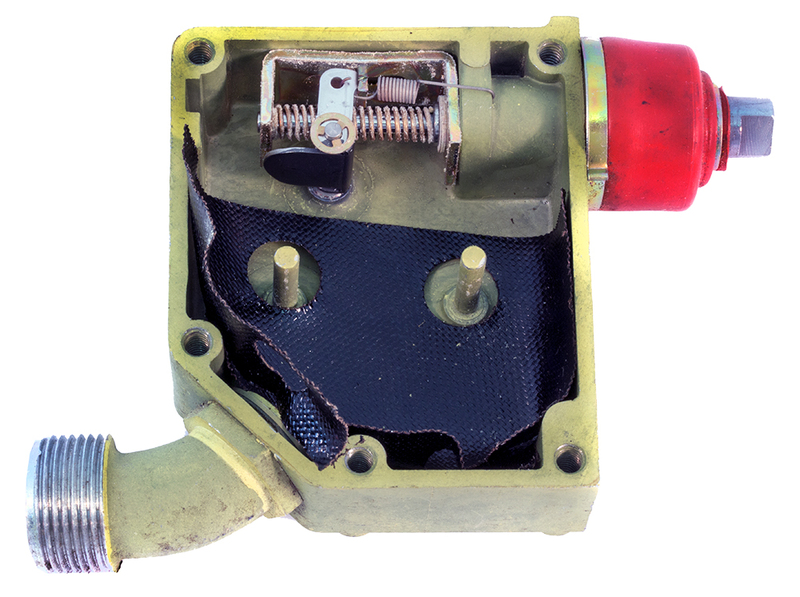 Honeywell side-push limit switch head, switch actuator with side plunger. 6.00 lbs operating force. 600v AC / 250v DC, 10º - 200ºF. 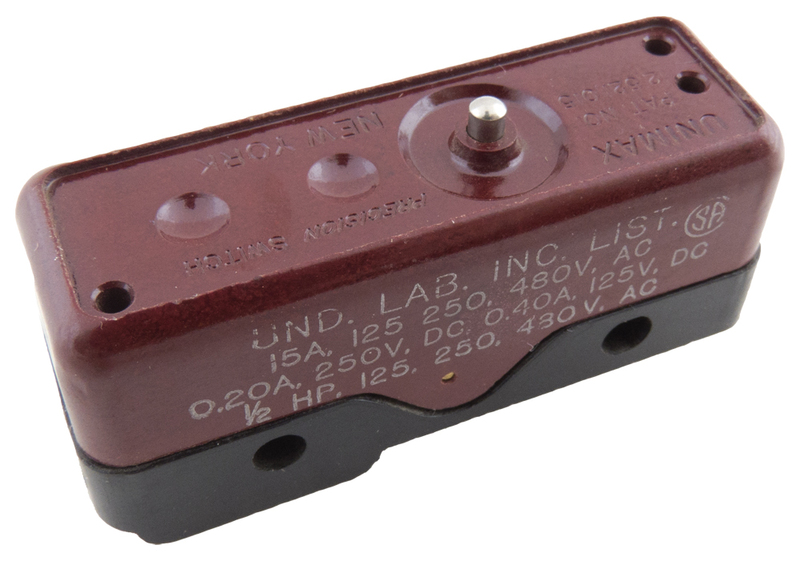 For use with HDLS LSE switches. Control Switch Division snap action switch. Double break, DPDT. Hermetically sealed. 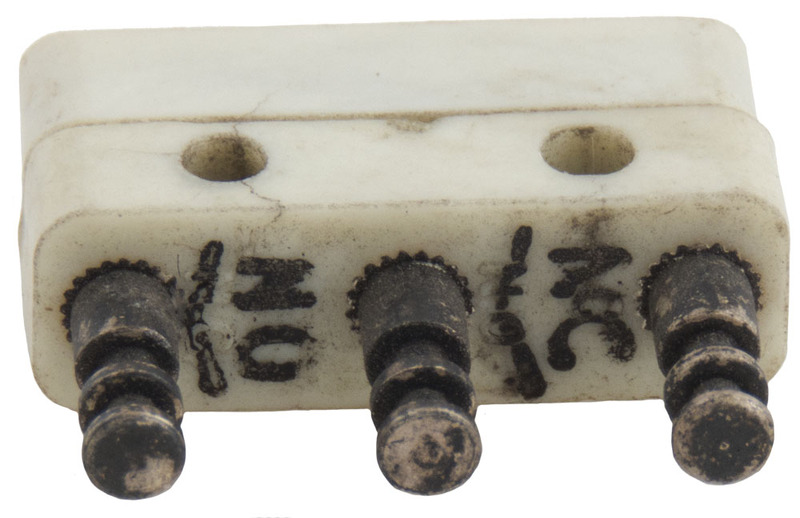 Control connector - 6 pin, 3 lug. 1.01"D x 3.5"L overall. 0.622"D threaded neck, 0.876" threaded length. C. Vac P/N: 30-06404-1. 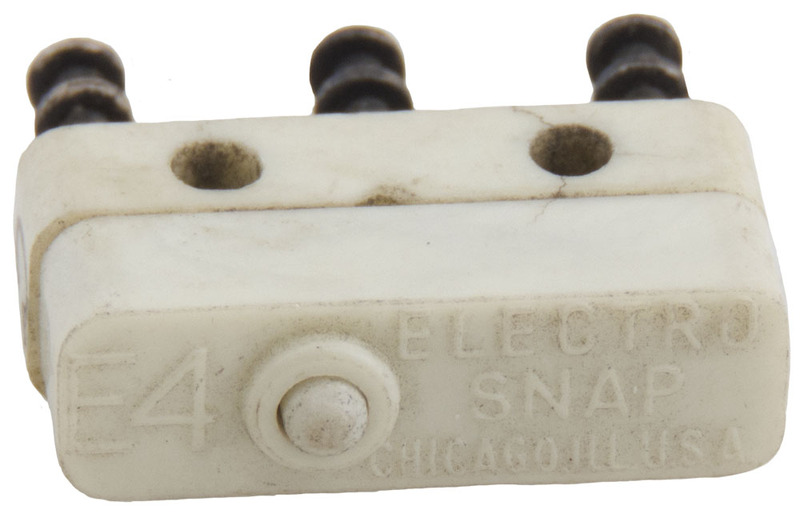 Robert Shaw snap action microswitch. 5 amp, SPDT. Feather touch actuator. Solder terminals. 5/8" x 1" mounting centers. New! Microswitch aircraft switch housing and plunger assembly. 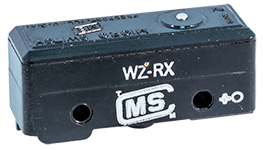 Mount any microswitch with 1" centers (SWM) MB-0-Z66 for example. Zinc chromate aluminum. Rubber seals. 2.03" inside width. 0.67" from actuator paddle to center of mounting post. 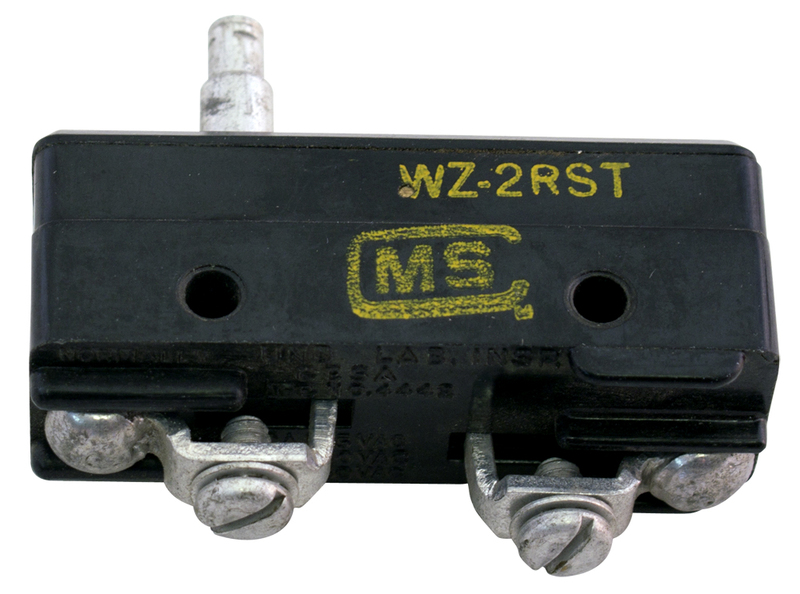 McGill snap action switch. 20 amp, 125 - 250v AC. Large 0.97" diameter black button. 16 oz. operating force. 1" mounting center in switch body. 1.49" mounting center top frame. 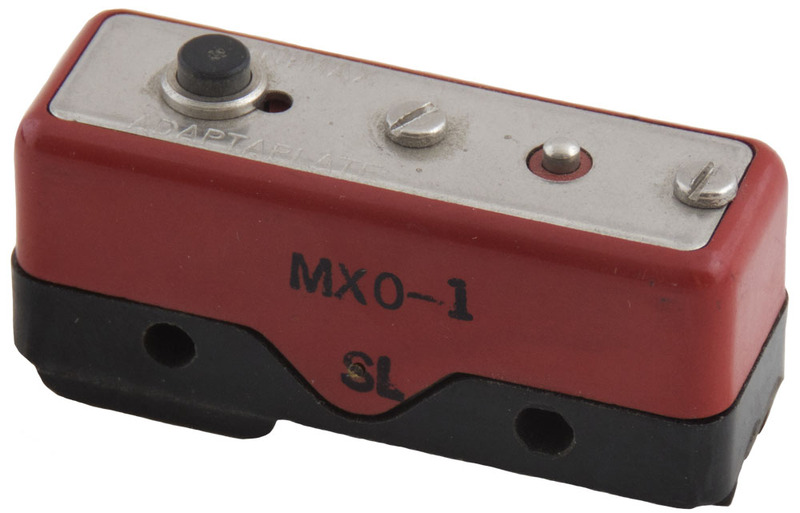 Unimax snap-action microswitch. 15 amp @ 125v AC, 5 amp @ 250v AC. 0.68" x 0.894"H top of button x 1.9"L. 1" mounting centers. Screw terminals with solder lugs. 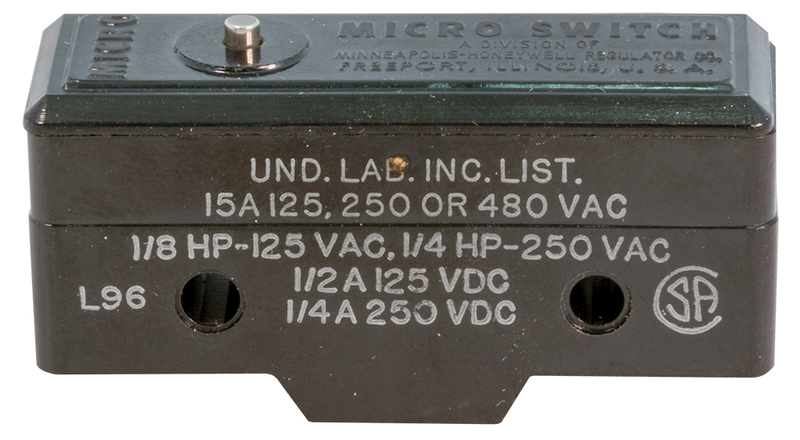 General Electric switchette micro switch. 2 pole. 120v / 240v, 1/2 HP. 0.497"W x 0.501"H x 1.25"L. 0.613" mounting center. Cherry sail / rotary micro switch. SPDT, 0.1 amp, 125v. This is the heart of a sail switch. Rotor is slotted for insertion of sail wire, (wire not included). 1" mounting centers. 0.2" spade / solder terminals. Cherry snapswitch. SPST, normally open. 10.1 amp, 1/4 HP, 125/250v AC. Plunger, rubber boot. Sealed for environmental conditions. 7/8" x 7/8" x 3/8". 5/8" mounting center. 12" long, 18 gauge leads with spade terminals. 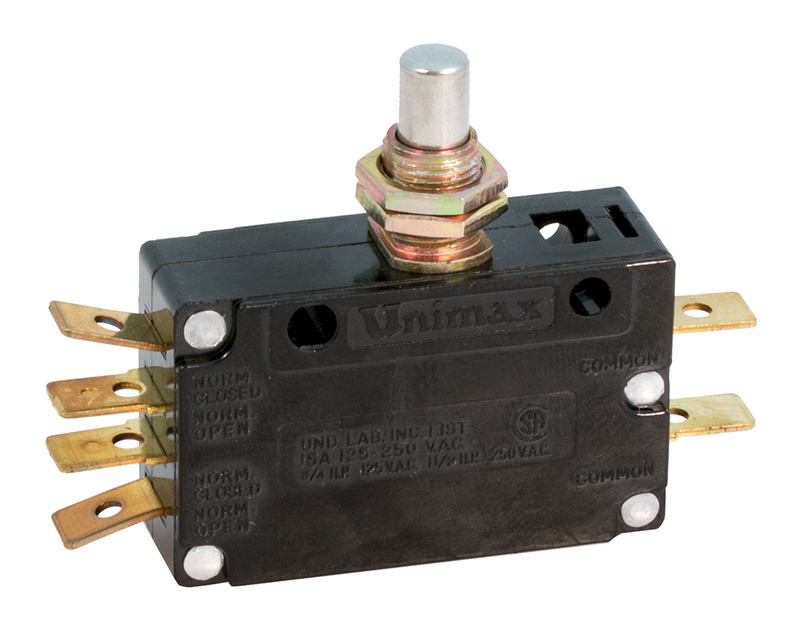 Unimax push-on / push off, spring return limit switch with SPDT, 15 amp maintained contacts. 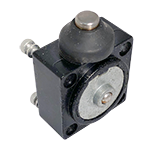 Pushing on momentary 0.156"D x 1"L shaft advances gear that depresses switch button into maintained contact ON or OFF position. 1" mounting centers on frame. QC spade terminals. 1.81" x 1.9" x 0.65" wide max body dimensions. Microswitch. 5 amp. SPDT. Plunger/bracket mount. 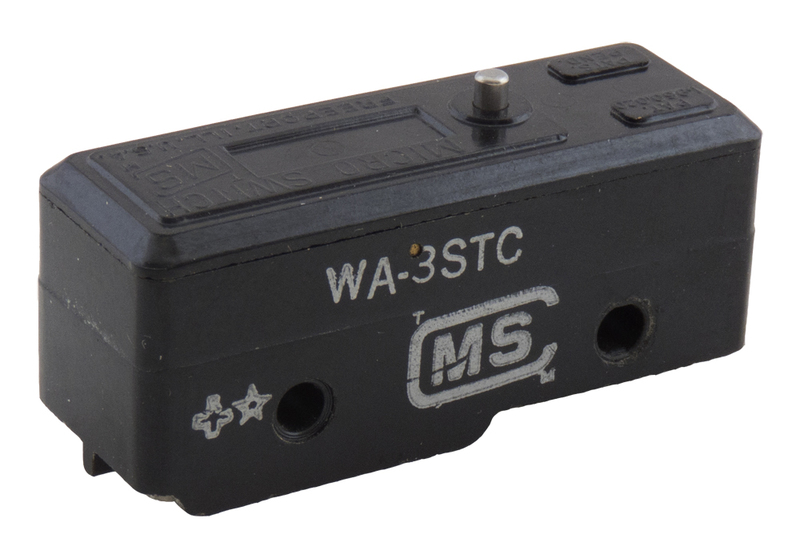 11SM3-T (switch). Solder turrets. Turret terminals. 1" x 1.1" mount plate. 3/8" c-c mount holes threaded. 17AC1-T (bracket) push/lever action. 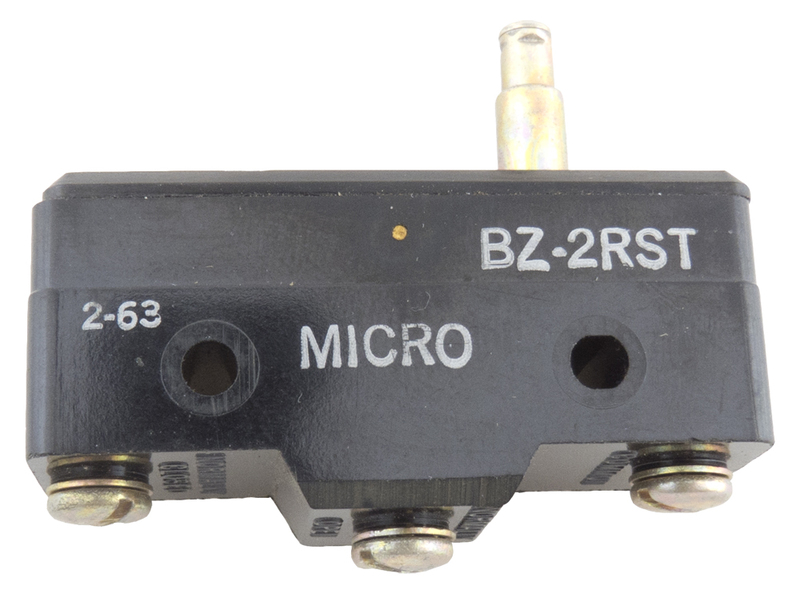 Microswitch. 15 amp @ 125, 250 or 460v AC. 1/2 amp @ 125v DC, 1/4 amp @ 250v DC. 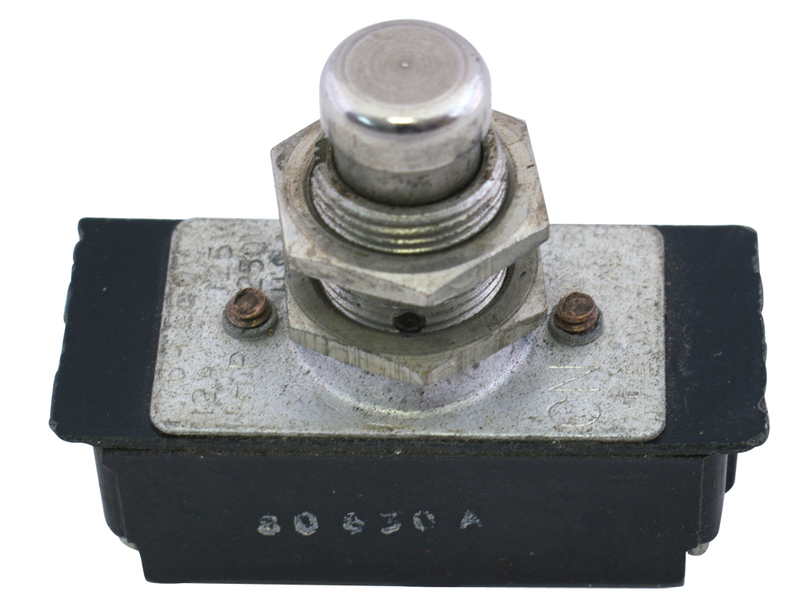 Type "Z" limit switch, snap action, plunger, single-pole, normally closed. 2 solder terminals. 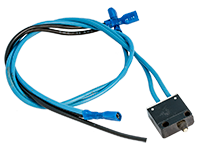 CEMCO switch. 5 amp @ 125v AC / 3 amp @ 250v AC. SPDT. Solder terminals. 5/8" x 1" c-c mount holes. Used removed from new equipment. UL & CSA listed. 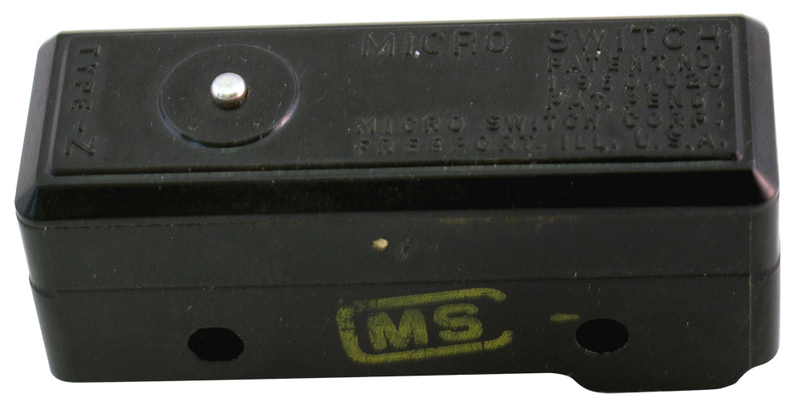 Microswitch Corp. snapswitch. 5 amp @ 125v. SPST, N.C. Plunger style. 1" c-c mount holes. 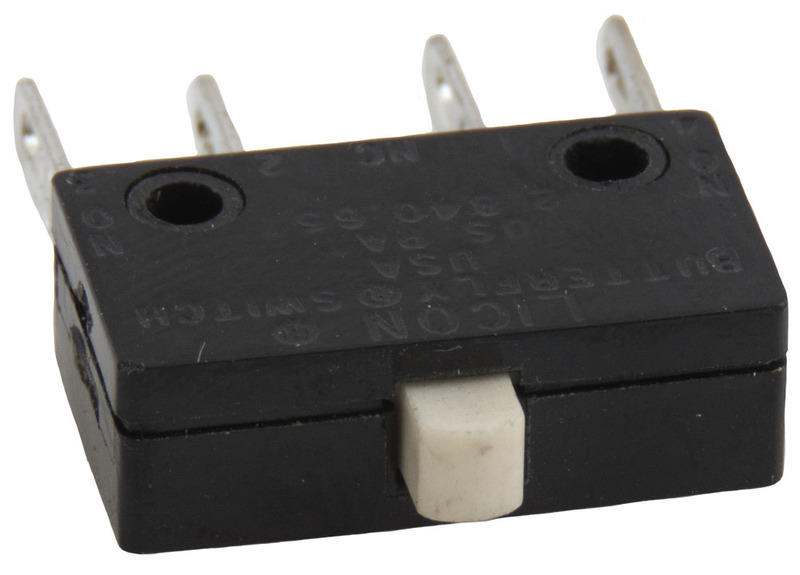 0.68" x 1.94" x 0.84"H.
MU switch. Type Q. 10 amp @ 125vAC / 5 amp @ 230vAC. 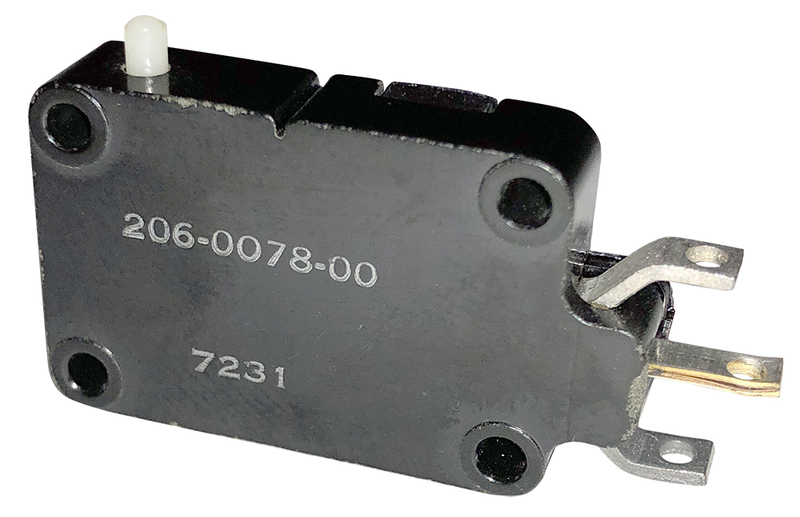 SPST, N.C. 0.692"d x 0.288"H.
Microswitch Corp. enclosed switch. 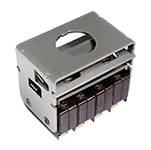 Operating force contact, 15 amp @ 125, 250, or 460v AC. Less than 1 pound operating pressure. Weather tight. 1/2" conduit connection. 3"W x 1" depp body plus flange. 2-13/16"H to top of button. 1-5/8" mounting center on bottom flange. 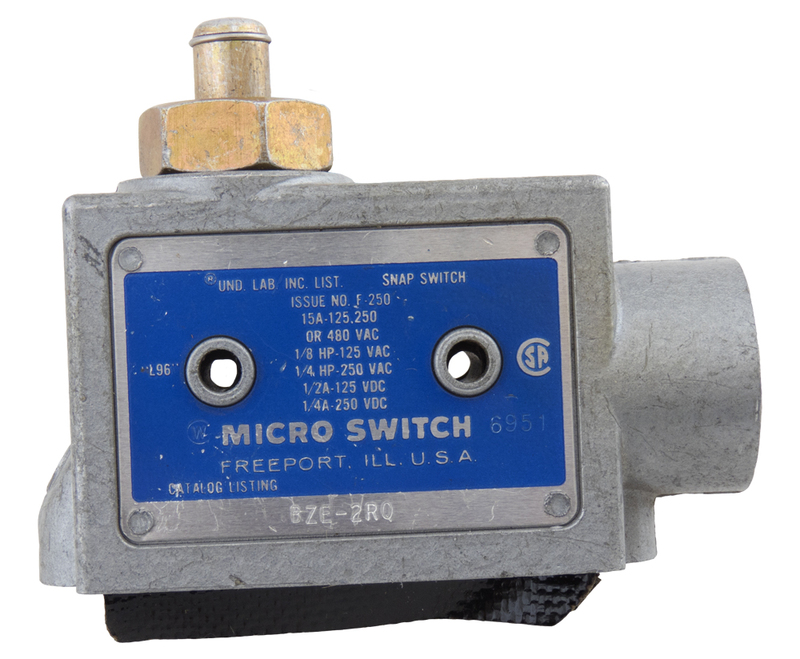 Microswitch Corp. snap action switch. 10 amp @ 125v, SPDT. Screw terminals. 2.07" x 0.82"W body. 2-1/8"H to top of button. 1.80" mounting center in top frame. 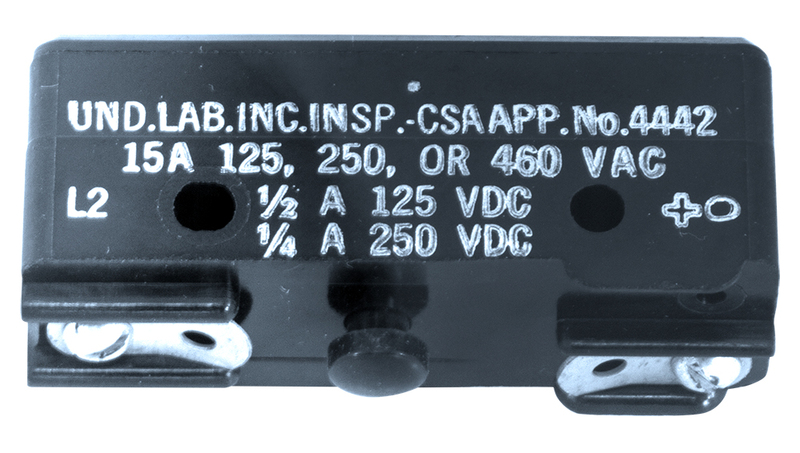 15 amp @ 125, 250 or 480v AC / SPST N.O. Microswitch Corp. switch. 15 amp @ 125, 250 or 480v AC. SPST, normally open. 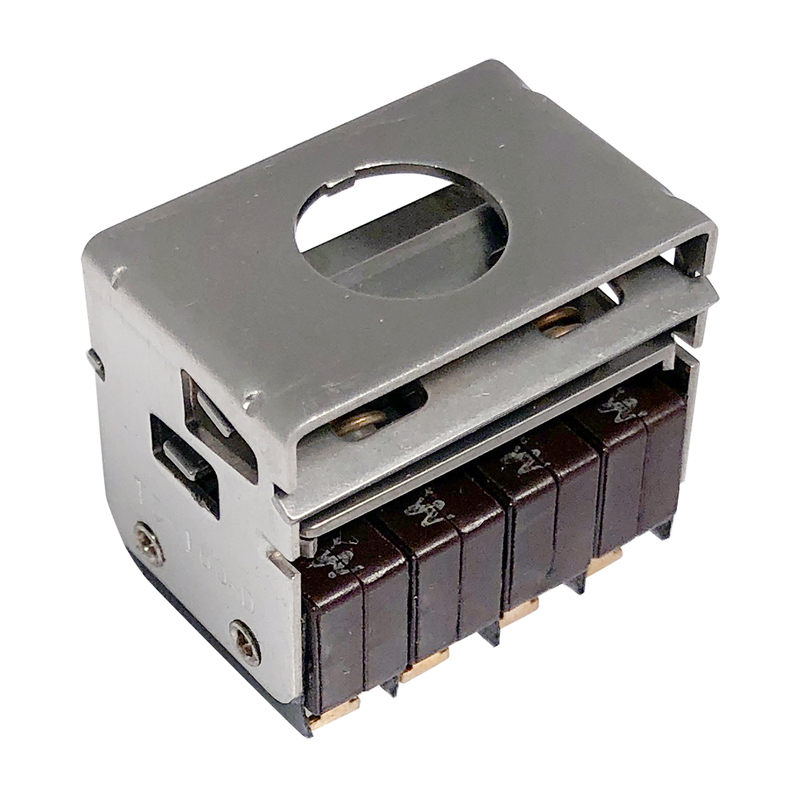 1/8 HP - 125v AC, 1/4 HP - 250v AC, 1/2A - 125v DC, 1/4A - 250v DC. 2 screw terminals. 0.69" x 1.05"H x 1.94"L. 1" mounting centers. CSA Listed. 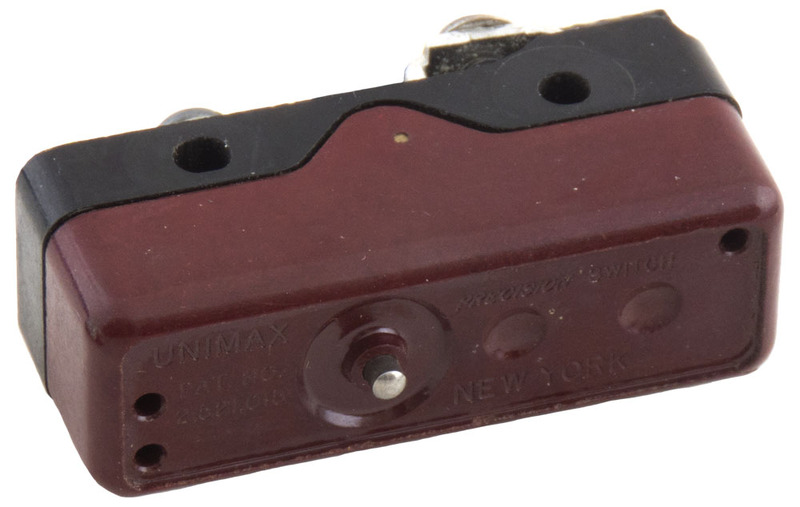 Unimax snap action switch. 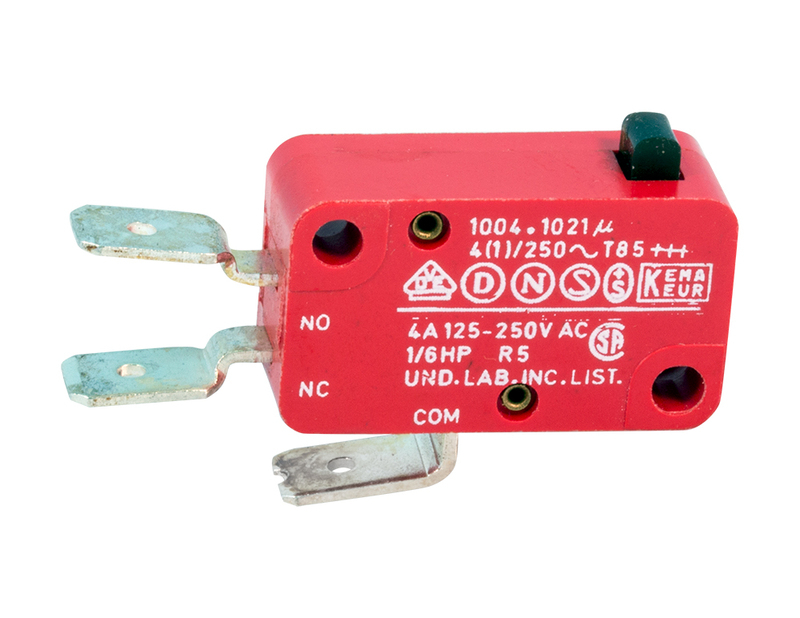 15 amp @ 125v - 250v. SPDT. 30 ounce switch activating force. 6 oz. release. 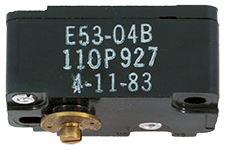 Actuator: 0.50" pre-travel max, 0.187" over-travel, 0.010" differential, 0.706" above switch top to end of actuator. Mounts in 0.375" hole. 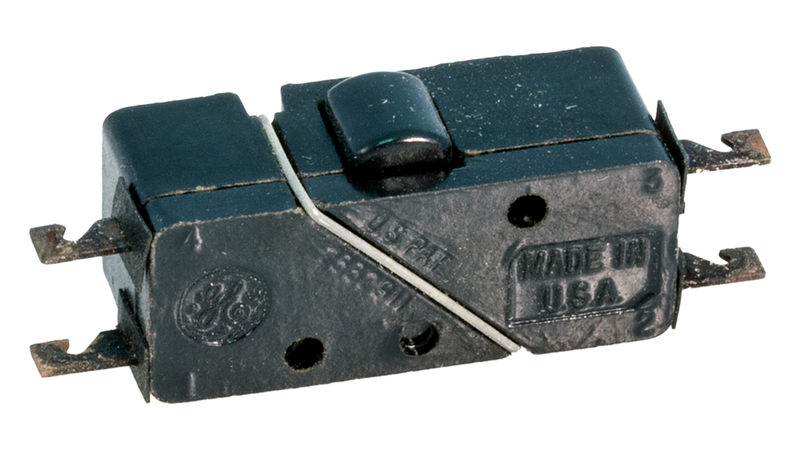 0.625"W x 1.8" body length or 2.57" with spade terminals. 1" mounting center. UL - CSA. 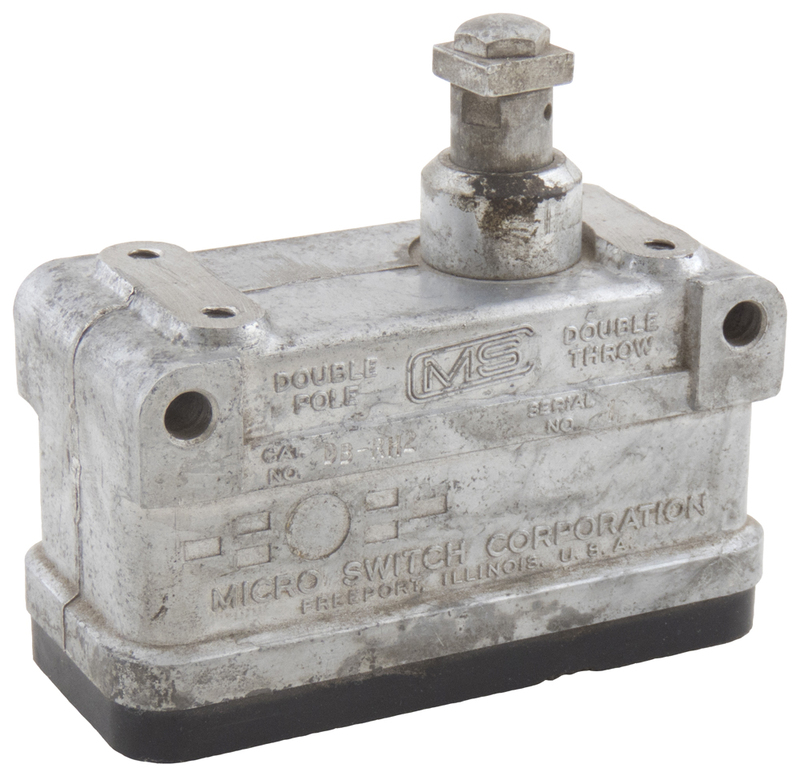 Microswitch Corp. pushbutton. 10 amp @ 125v / 5 amp @ 250v AC / 3 amp @ 450v AC. SPST, N.C. contacts. Solder terminals. 0.5"L plunger post. 0.68" x 1.94" x 0.84". 1" c-c mount holes. Light touch-minimal movement on plunger. 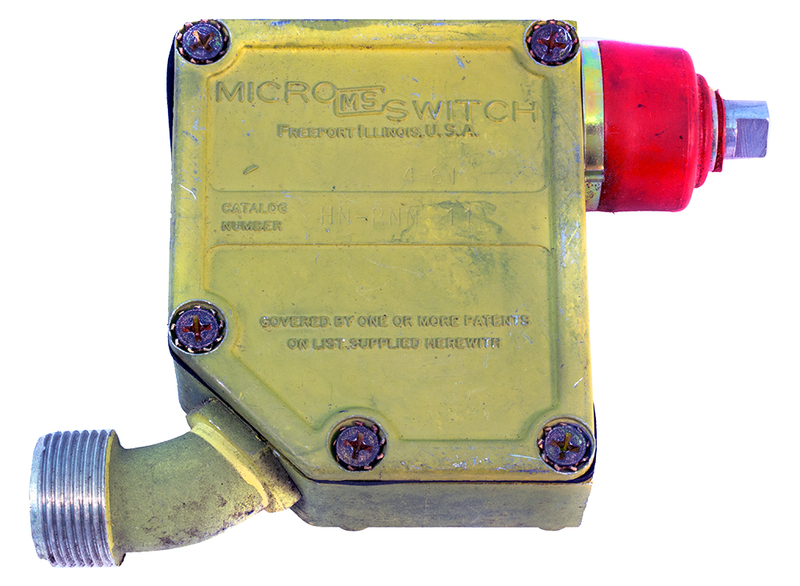 Microswitch Corp. microswitch. 10 amp @ 125v / 5 amp @ 250v AC / 3.5 amp @ 460v AC. SPST, N.C. contacts. Screw terminals. 0.5"L plunger post. 0.68" x 1.94" x 0.84". 1.58" overall height. 1" c-c mount holes. Light touch-minimal pressure on plunger. 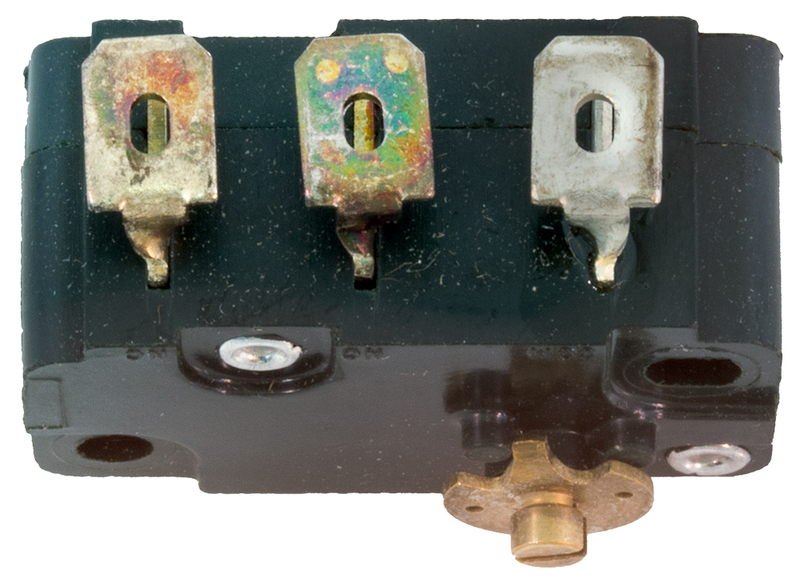 Robertshaw® panel bushing mount dual microswitch. DPDT. 10 amp @ 125v, 5 amp @ 250v. Low pressure button. Requires 0.5" panel opening. 1-1/8" behind. Removed from service. NSN: 277-0035-00. Microswitch Corp. pushbutton microswitch. Normally closed - SPST. Type Z. 10 amp @ 125v AC, 5 amp @ 250v AC, 3 amp @ 465v AC. 0.68" x 1.94" x 0.84". 1" c-c mounting holes. 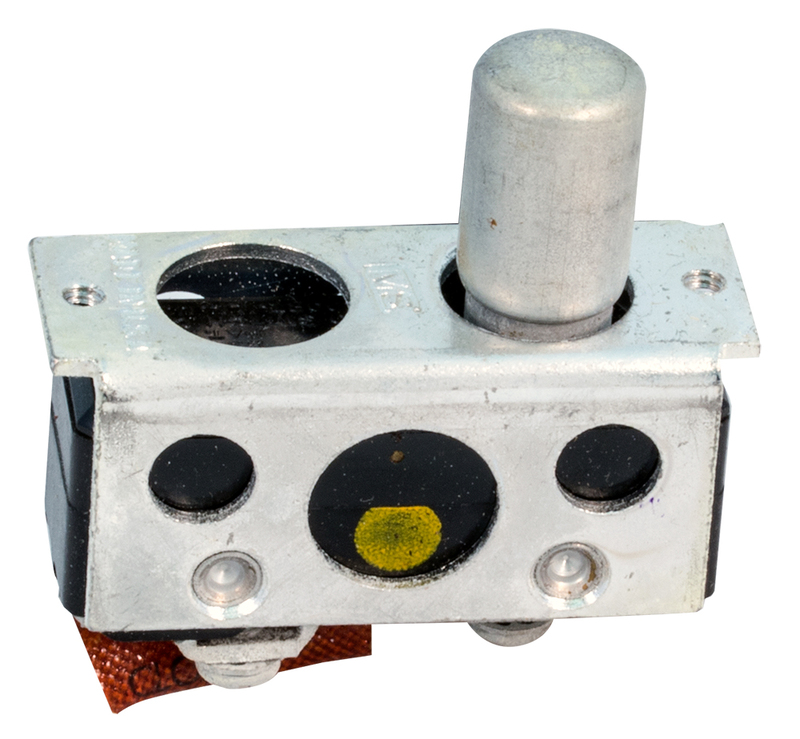 Microswitch pushbutton. 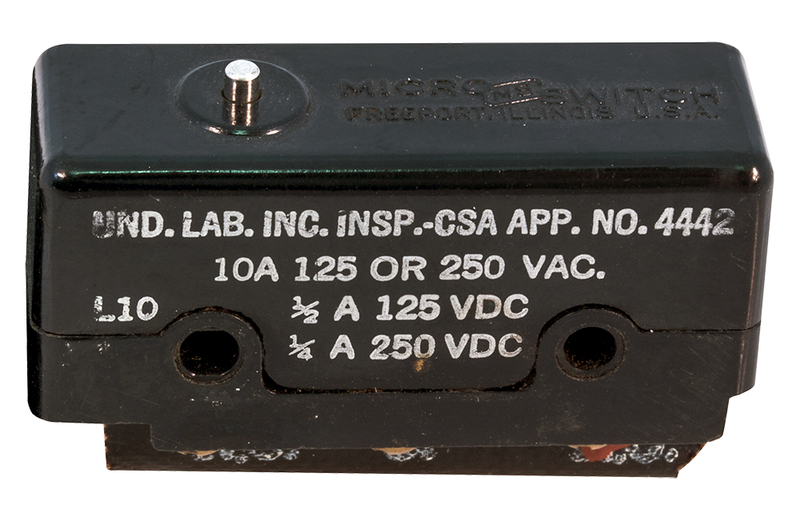 10 amp @ 125v / 5 amp @ 250v / 3 amp @ 460v. 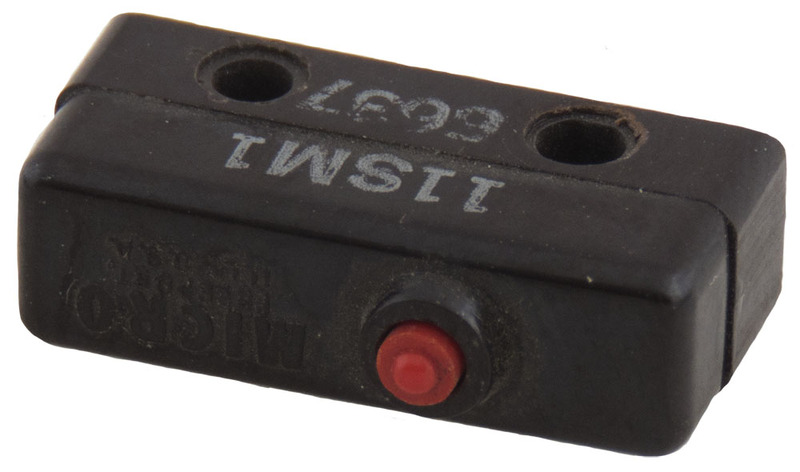 SPST - N.C. Screw / solder terminals. Type Z. 1" c-c mount holes. Bakelite case. 0.678" x 1.925" x 0.814"H. 1970's. 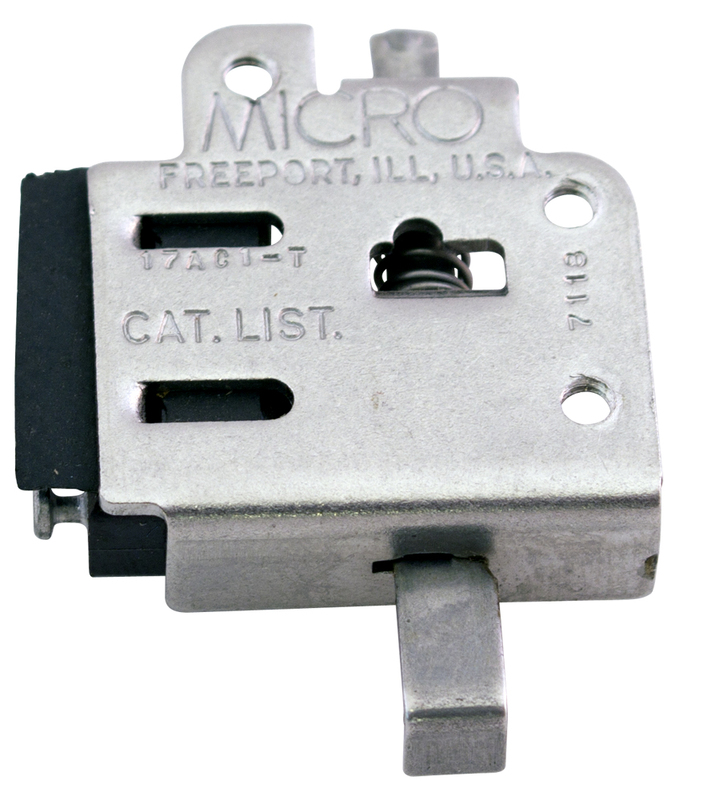 Microswitch. DPDT. 10 amp @ 125/250vAC. 1/2 amp @ 125v DC. 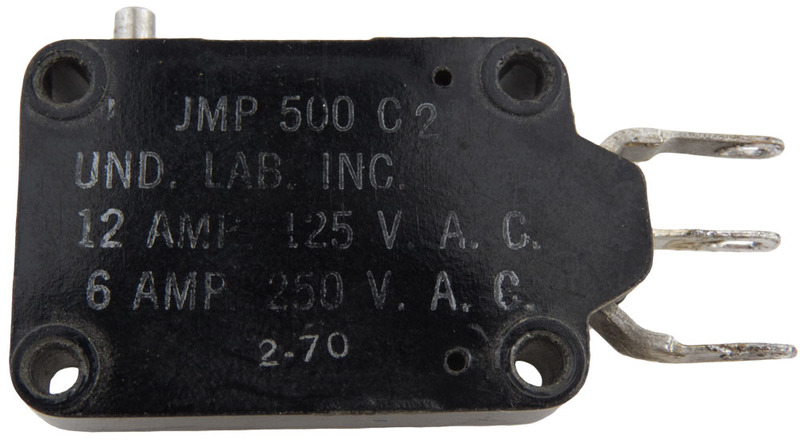 1/4 amp @ 250vDC. Screw terminals. 1" mounting centers. UL listed. 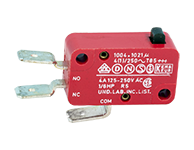 Licon microswitch. 10 amp @ 125 / 250v AC. 2 contacts: one is N.O. and the other is N.C. 0.252" x 0.785" x 0.440"H. 1/2" mounting centers. Microswitch Corp. plunger style microswitch. Type Z. 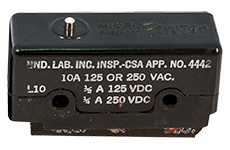 10 amp @ 125v / 5 amp @ 250v / 3 amp @ 460v / 2 amp @ 600v. Bushing fits 0.465" hole. 1" c-c mount holes. 0.68" x 1.94" x 0.84". 1.79" overall height with button. 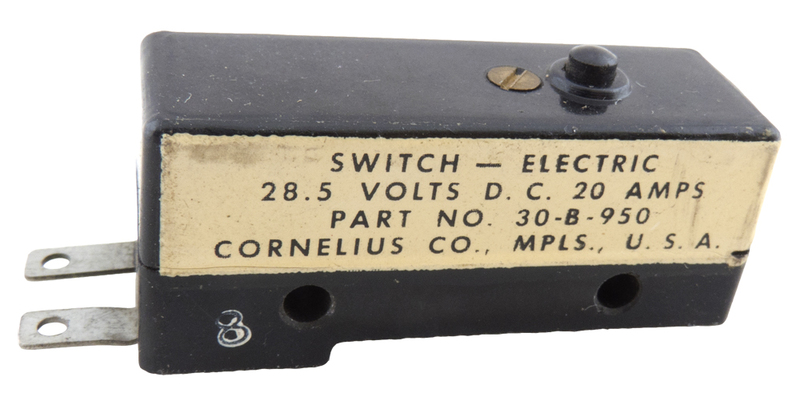 Columbus Electric Manufacturing Co. microswitch. SPDT. 12 amp @ 125v AC, 6 amp @ 250v AC. 1.341" x 0.821" x 0.275". 5/8" x 1" mounting centers. 1/8" spade terminals. Removed from service. DC 4-70. UL listed. 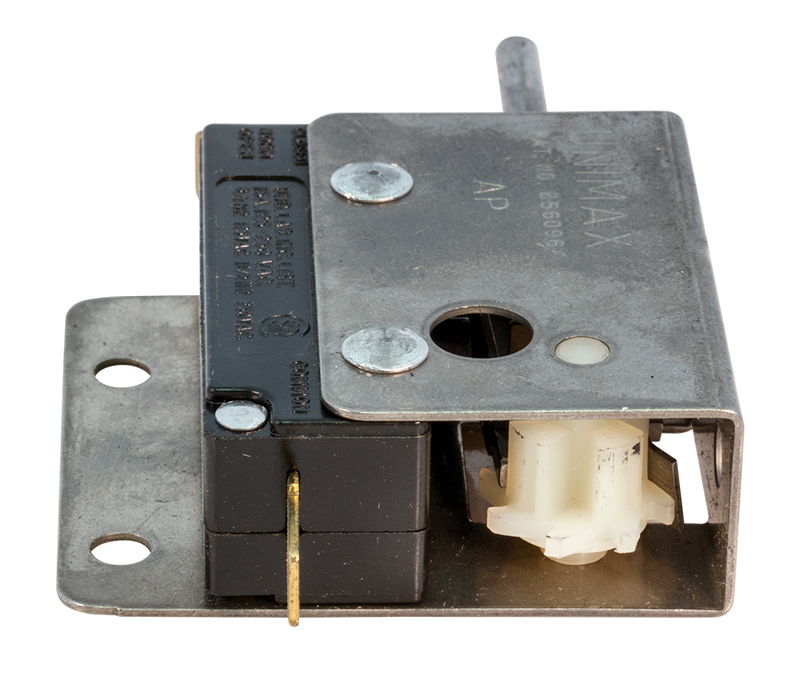 AH&H microswitch. 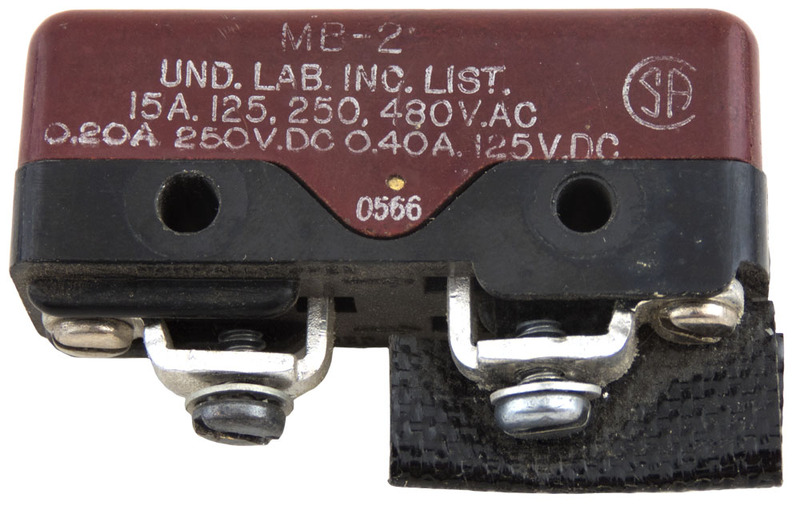 12 amp @ 125v / 6 amp @ 250v. DPST. N.C. contacts. 7/16" mounting hole. UL listed. 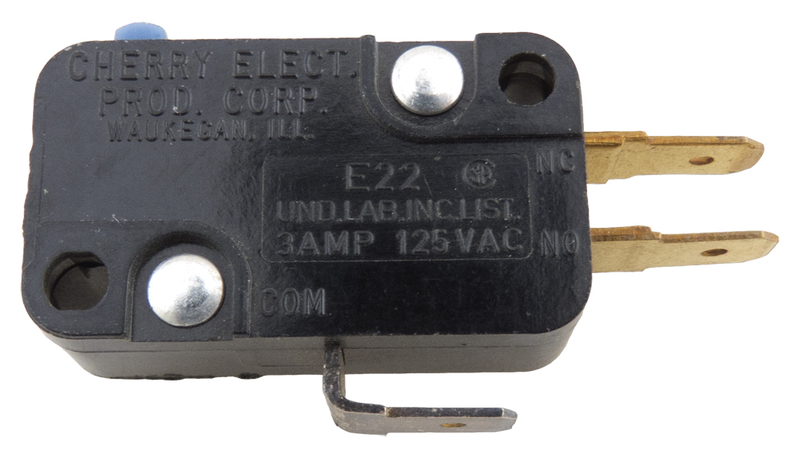 Cherry Electric Co. pushbutton microswitch. 15 amp. DPDT - single action. 1" c-c mount holes. 1/4" spade terminals. 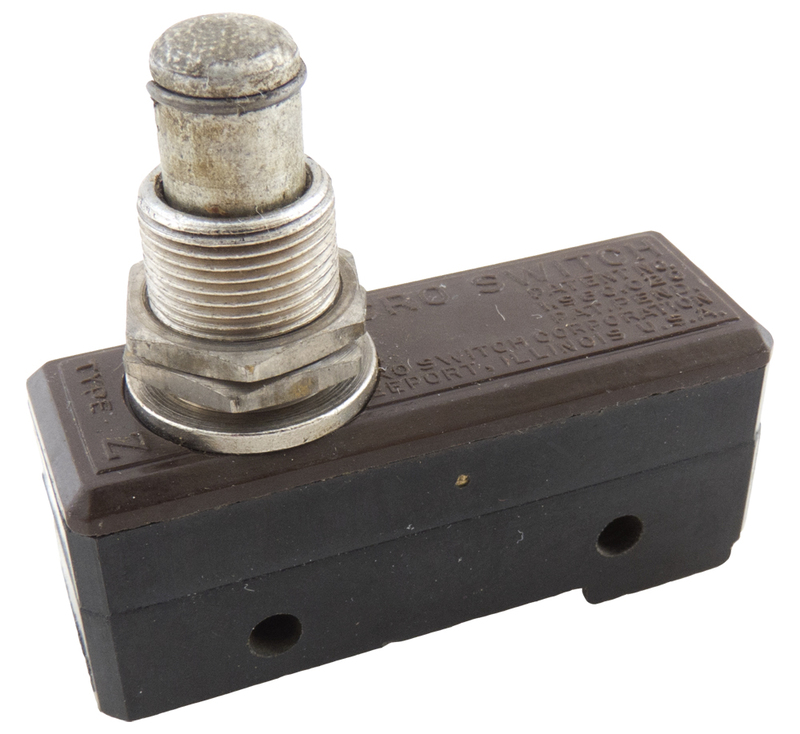 1.81" x 0.63" x 1.12"H.
Plunger style microswitch. 15 amp, DPDT. Fully enclosed body. 8 ounce release pressure. 48 ounce actuating force. 2.15" c-c mount holes. 1-1/4" x 2-5/8" x 1-1/2". 2.4" overall height. 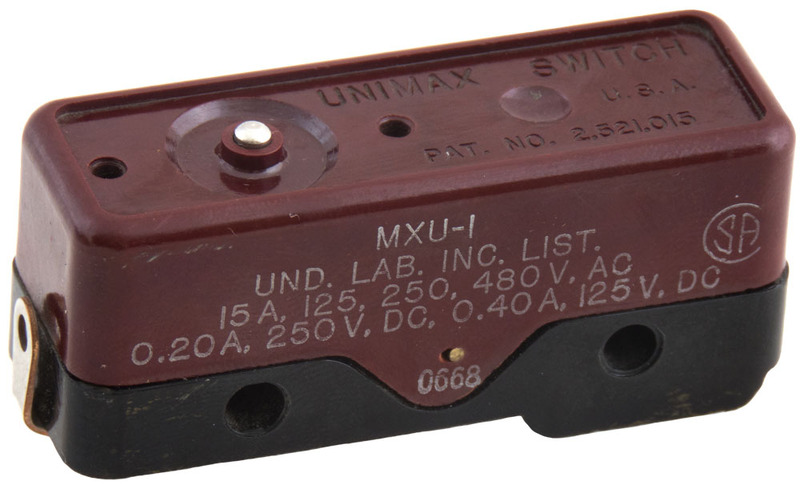 Unimax microswitch. 15 amp @ 125/250v. N.O. 3/4 H.P @ 125v AC, 1-1/2 H.P. @ 250v AC. Button centered on mounting holes. 1" mounting centers. 1/4" QD terminals. 2-1/2"L x 5/8" x 5/8". 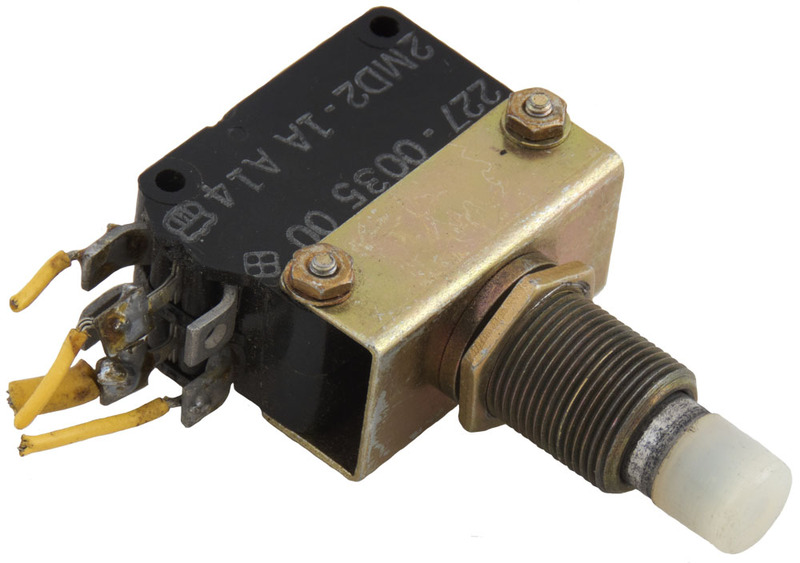 Plunger style microswitch. 15 amp @ 125/250/460vAC, SPDT. 1/2 amp @ 125v DC / 3/4 amp @ 250vDC. Roller lever. 3.1" long push rod. 7/16" overhang. Depresses to 11/32" to make switch. 1.38" x 2.26" x 0.753" bracket. 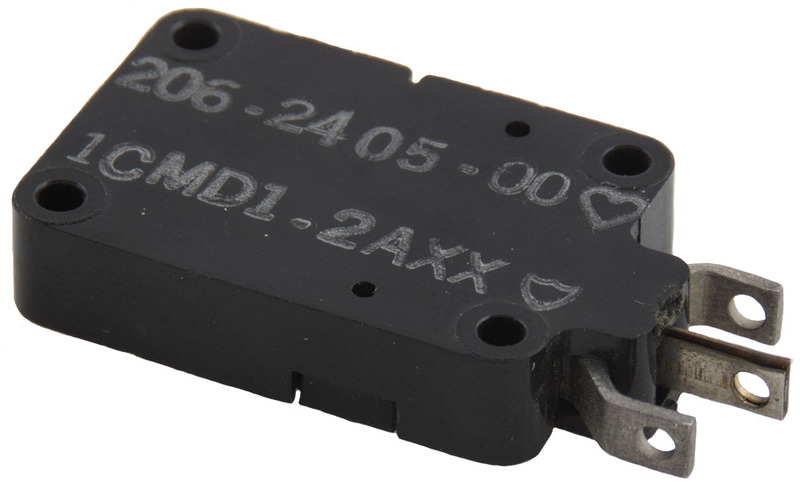 Microswitch snapswitch. 15 amp @ 125 / 250 / 480v AC. 1" c-c mount holes. 2.4" to top of plunger. 1/2" EMT connection. Contact makes @ 2.384". 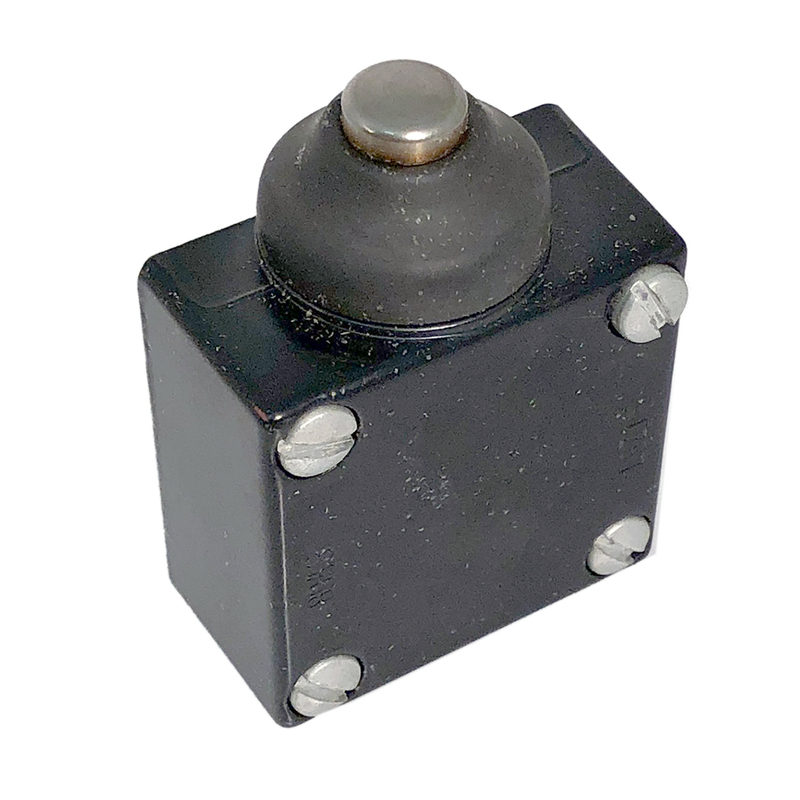 1" x 3" x 2"H.
Microswitch Corp. plunger pushbutton microswitch. 15 amp @ 125 / 250 / 480v AC, SPDT. Screw terminals. 1" c-c mount holes. 1.60" to top of plunger. Contact makes @ 1.585". 0.68" x 1.94" x 0.84". 1.577" overall height. Microswitch Corp. pushbutton microswitch. Rubber boot dust cover pushbutton plunger style. SPDT, 15 amp @ 125/250/480v AC. Screw terminals on bottom. Rubber boot dust cover. 1" c-c mount holes. 2.336" to top of boot. Contact makes @ 2.325". 0.68" x 1.94" x 0.84"H. 2.33" overall height. Cherry snapswitch. 3 amp @ 125v AC. SPDT. 1" c-c mount holes. Spade terminals. 1.093" x 0.375" x 0.624". 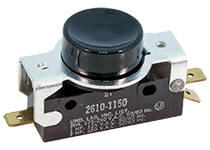 Unimax pushbutton microswitch. SPDT. 15 amp @ 125 / 250 / 480v AC. 1" c-c mount holes. 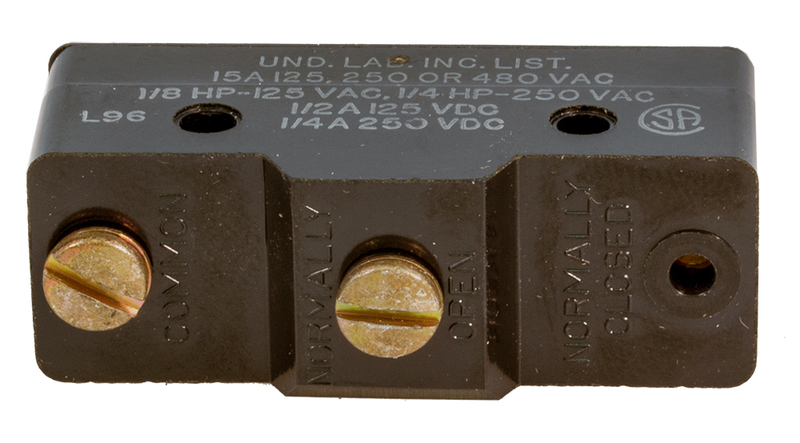 0.94" x 0.68" x 1.813"L.
Unimax 4 gang microswitch. DPDT. Plunger pressing into hole on top moves cantilevered arm to actuate all 4 switches at one time. Cherry snapswitch. 0.10 amp @ 125v AC, SPDT. 0.375" c-c mounting holes. 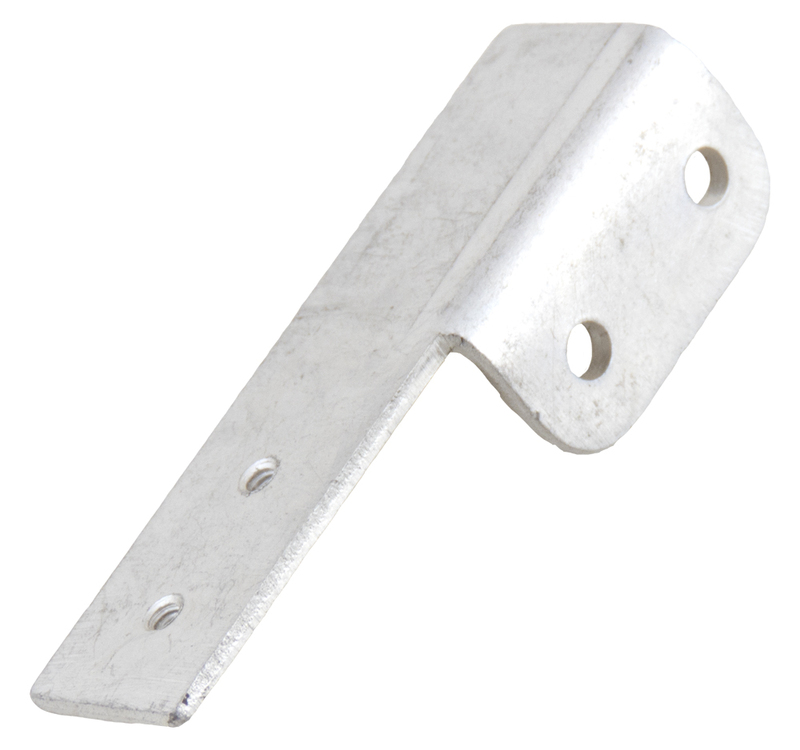 0.25" x 0.75" x 0.35"H. Optional bracket (SWM) BRKT also can be used. 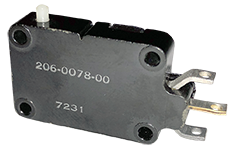 Unimax microswitch mounting bracket.1.953" x 0.503", 4/40 threaded 3/8" c-c. 0.895" x 0.503", 1/8 unthreaded 1/2" c-c. 0.064" thick. 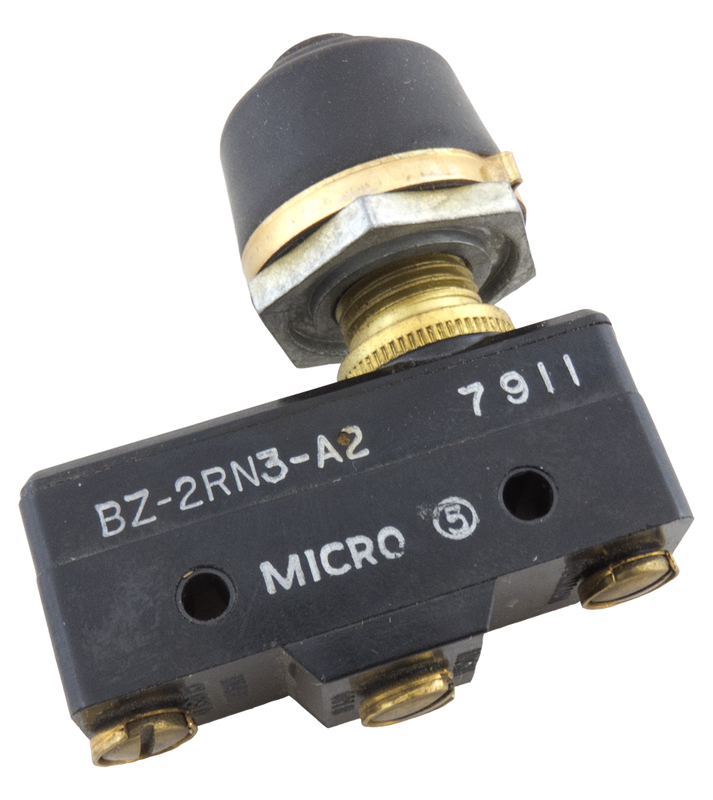 Micro microswitch. SPDT. 5 amp @ 250v AC. Possibly used solder cups. 3/8" mounting centers. DC 66+. 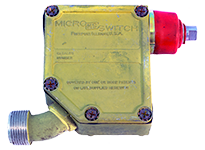 Microswitch Corp. microswitch. SPDT. 5 amp @ 250v AC. Solder turrets. 0.781" x 0.248" x 0.356". 3/8" mounting centers. UL listed. 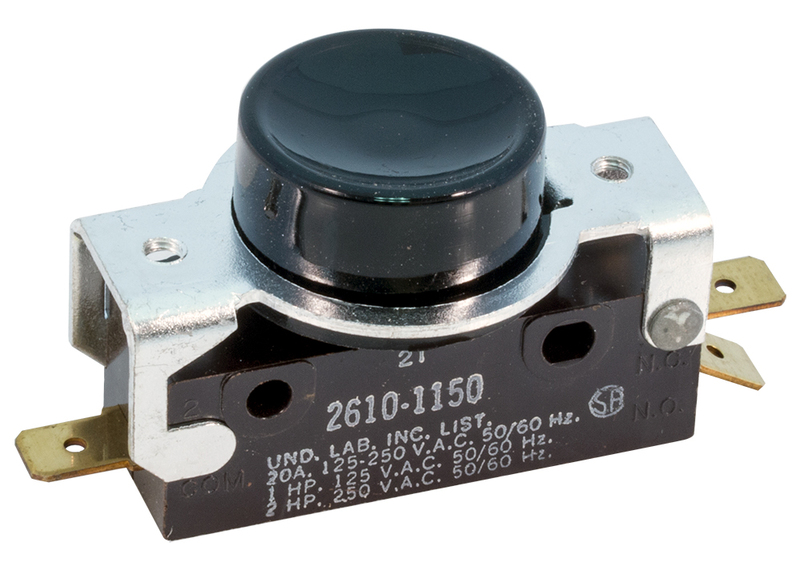 Unimax pushbutton microswitch. Contacts: DPDT. Double action, 2 stage. Each pole activates with further movement (2 clicks). 15 amp, 125 / 250v AC. 3/4 HP, 125v DC. 1-1/2 HP, 250v DC. 1.82" wide x 0.62" thick x 1.15" high body. 1.50" overall height including button. (see More Images). 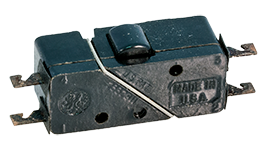 1/4"W spade terminals (terminals add 0.375"L each end). 1" c-c mount holes. Activator button has rubber boot and red contact button overlay. 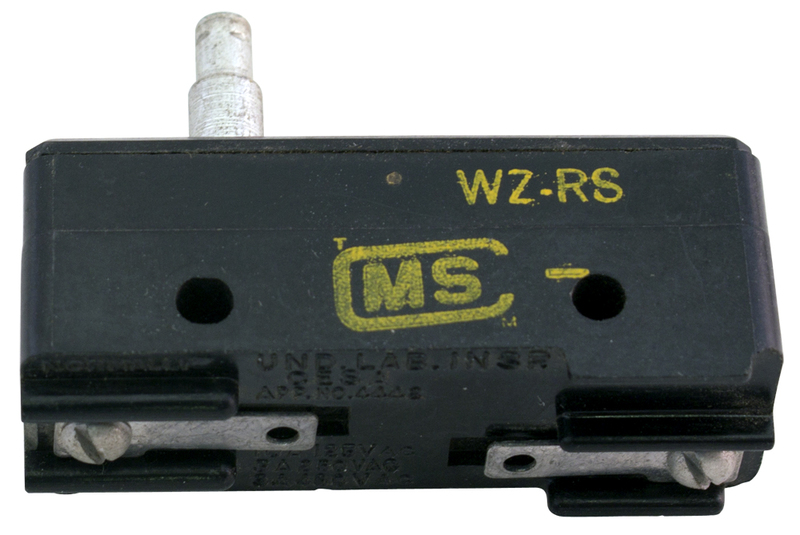 Cornelius Co. microswitch. 20 amp @ 28.5vDC. SPST, N.C. Actuator button is very stiff. 1" c-c mount holes. 1.923" x 0.682" x 0.758". 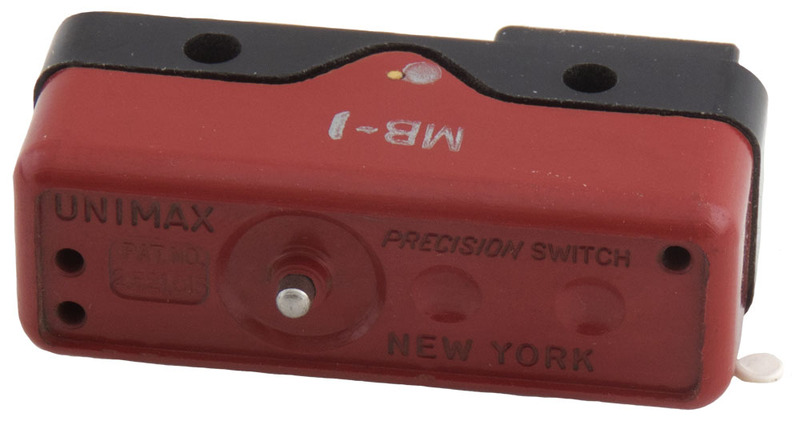 Unimax pushbutton microswitch. SPST. N.O. contacts. 15 amp @ 125v AC, 5 amp @ 250v AC. No spring return. Reset button on top of switch. 0.68" x 1.94" x 0.84". 1" mounting centers. 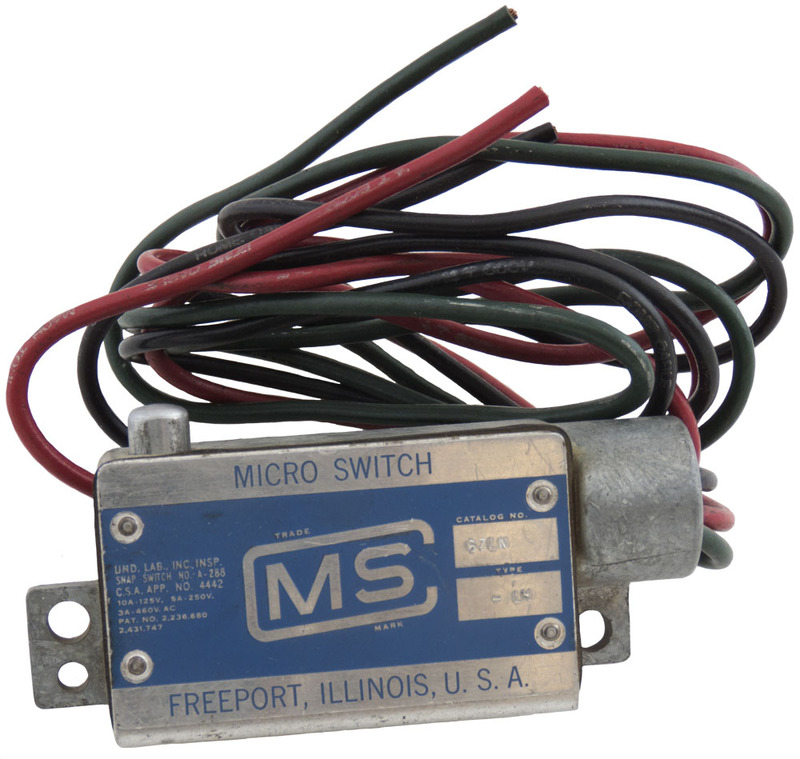 Microswitch Corp microswitch. Cast aluminum housing with FIP electrical connection. 1.7" x 4" x 1"H. Three 24" leads. 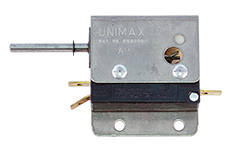 Unimax pushbutton microswitch. SPST. N.O. contacts. 15 amp @ 125 / 250 / 480v AC, 0.2 amp @ 250v DC, 0.4 amp @ 125v DC. No spring return. Reset button on top of switch. 0.68" x 1.94" x 0.84". 1" mounting centers. UL & CSA listed. 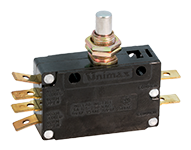 Unimax pushbutton microswitch. SPDT contacts. 15 amp @ 125 / 250 / 480v AC, 0.2 amp @ 250v DC, 0.4 amp @ 125v DC. No spring return. Reset button on bottom of switch. 0.68" x 1.94" x 0.84". 1" mounting centers. DC 68+. CSA listed. 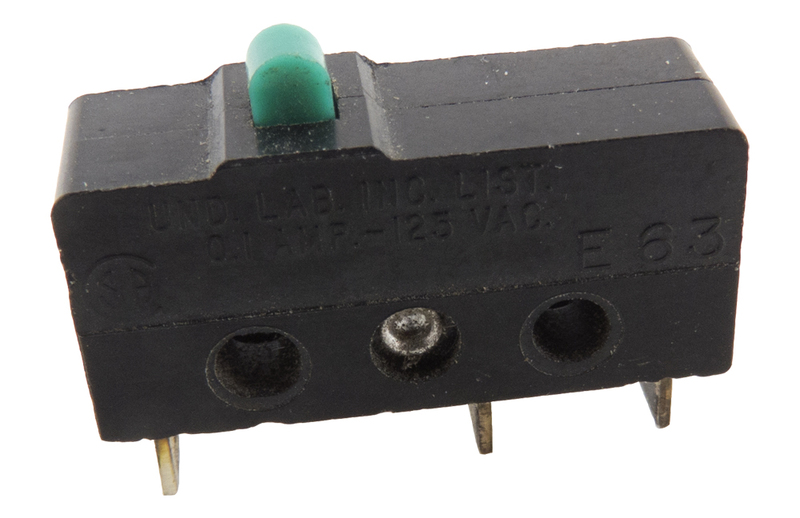 Unimax pushbutton microswitch. SPDT. 15 amp @ 125v AC, 5 amp @ 250v AC. 1" c-c mount holes. Solder tabs. 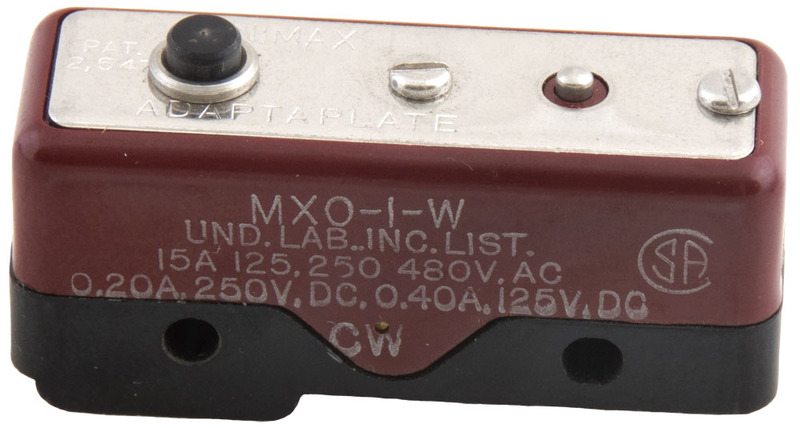 0.69" x 1.94" x 0.83"H.
Unimax pushbutton microswitch. SPDT contacts. 15 amp @ 125 / 250 / 480v AC, 0.2 amp @ 250v DC, 0.4 amp @ 125v DC. Large screw terminals on bottom. 0.69" x 1.94" x 0.83"H. 1" mounting centers. DC 66+. UL & CSA listed. 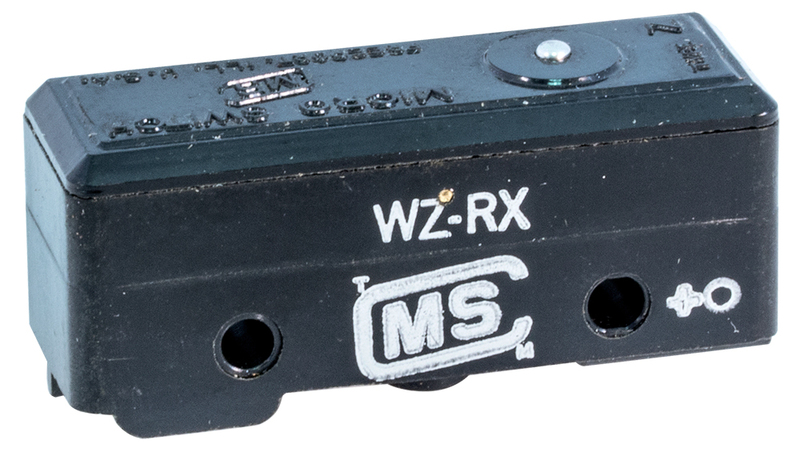 Robertshaw® microswitch. SPDT. 3 amp @ 250v AC. 0.827" x 1.38" x 0.270". 0.146" spade terminals. 1" x 5/8" mounting centers. 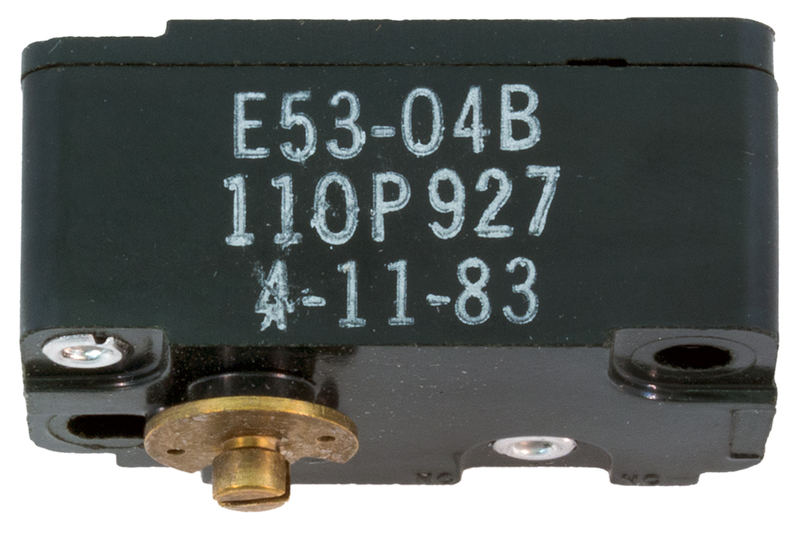 ElectroSnap microswitch. SPDT contacts. Solder turrets. 0.781" x 0.254" x 0.369". 3/8" mounting centers. Omron snap action micro switch. SPDT. PC mount. 125 vac @ 5 amps, 250 vac @ 3 amps. 16 grams operating force. 0.779" x 0.374" x 0.241" thick. 0.375" c-c mounting holes, 0.090" diameter. Alps micro switch. SPDT with lever. Shown in resting "up" position. 125v, 1 amp. 3/4" x 1/2" x 1/4"W. 3/16"L arm. 0.655" c-c mounting holes. Made in Japan. 45,000 pcs available. 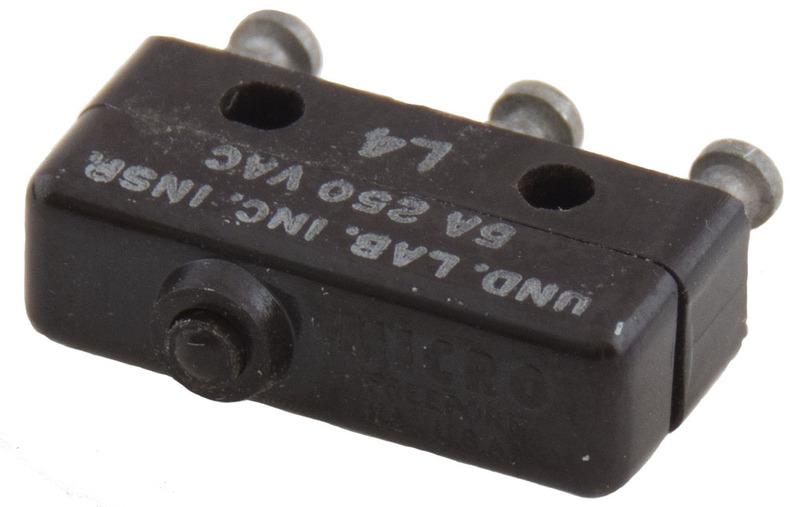 Licon microswitch. 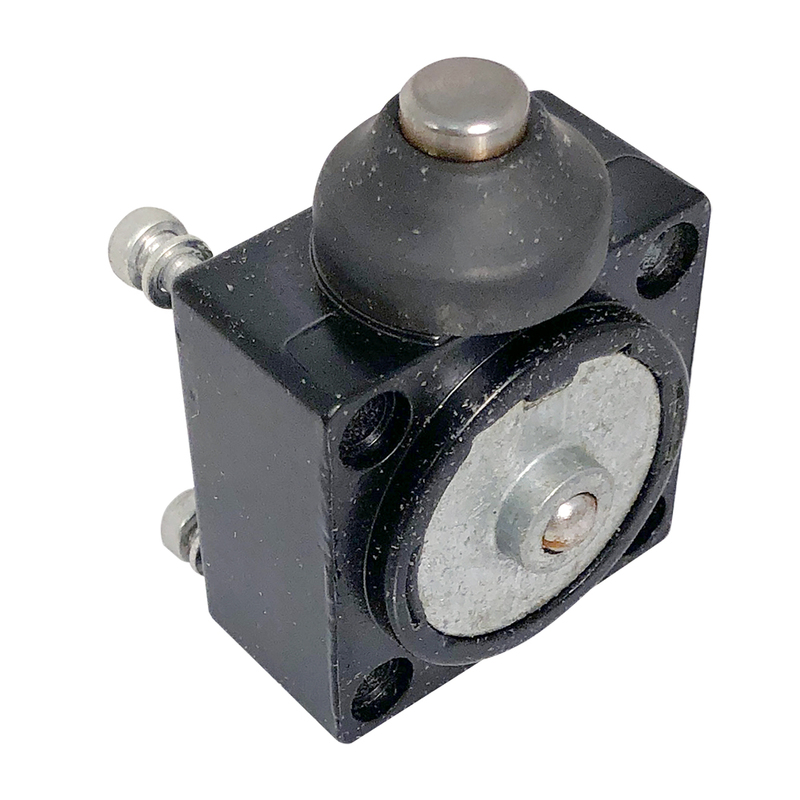 Accepts up to 0.343" diameter plunger into bushing mount socket. Microswitch in bottom of socket. 5PDt, 10 amp, 125v / 250 vac. UL listed. 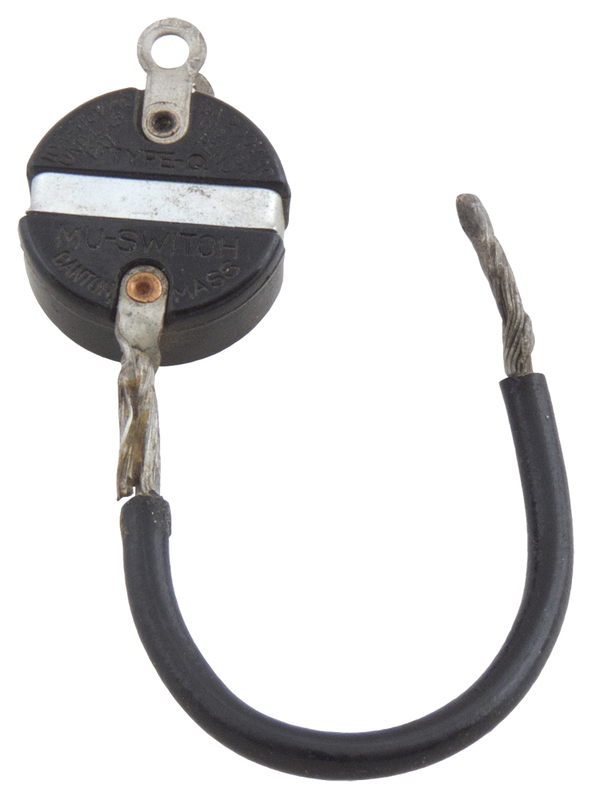 Cherry Electric Co. lever micro switch. DPDT maintained, latching. 7.5 amp, 125 vac, 5 amp, 250 vac. Mounting thru holes 1/4" c-c. 1/4" travel on lever. 0.32"W x 0.8"H x 1.5" deep. Collins P/N: 266-0089-010. NSN: 5930-01-123-6511. 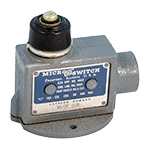 Micron Instruments rotary limit switch. Servo / clamp ring mount. 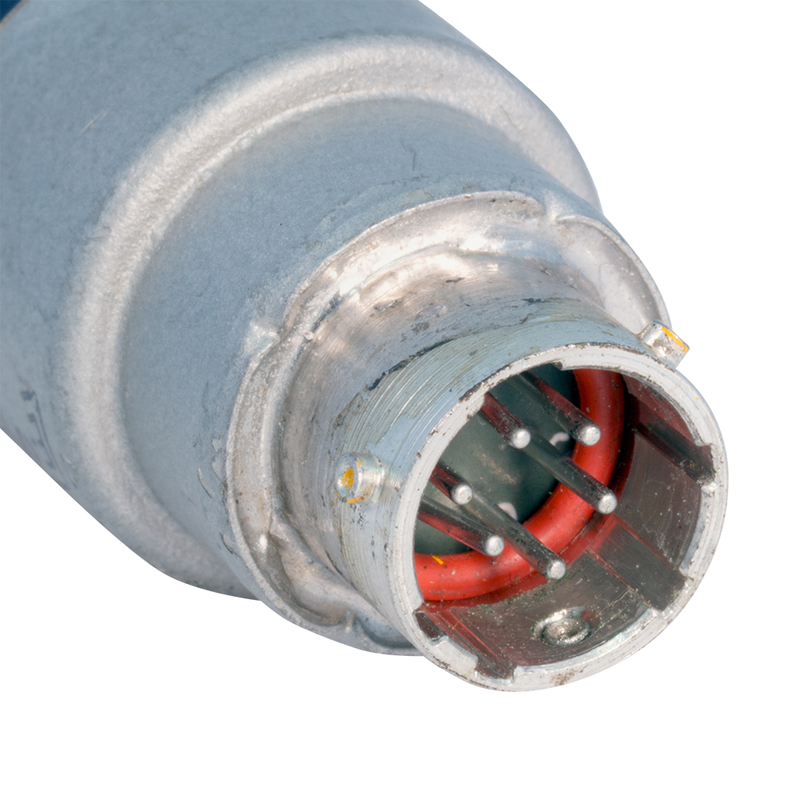 19 pin circular connector. 0.364" diameter shaft. 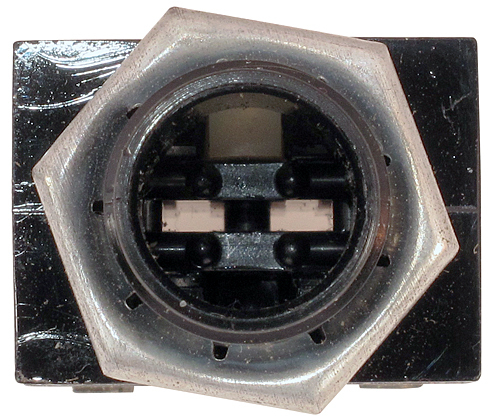 3-1/2"D x 5"L. 512 turns to repeat function and infinitely adjustable cams. 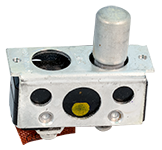 Triple limit switch assembly. 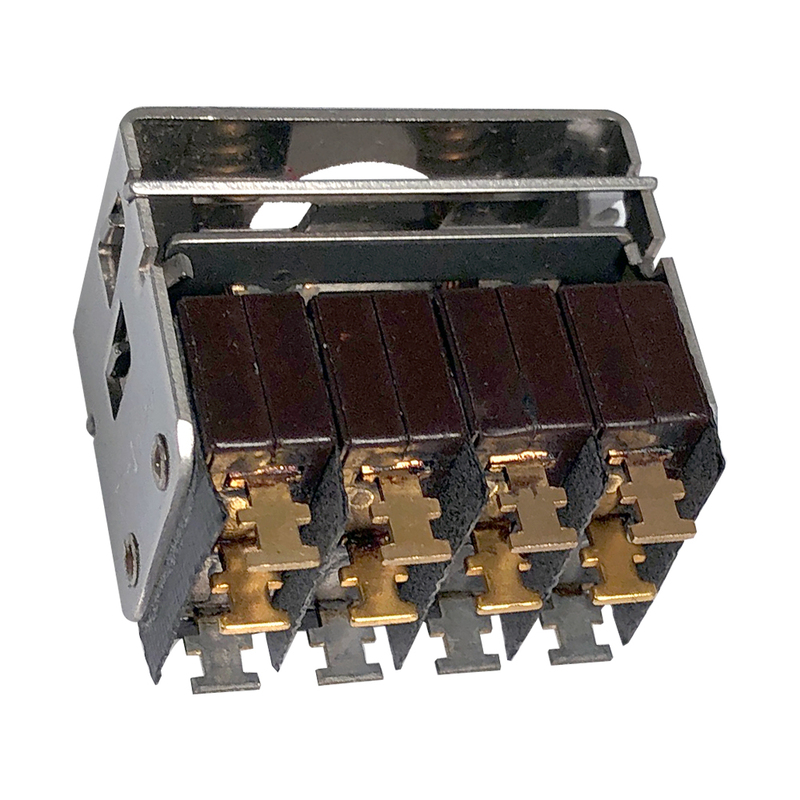 Six Honeywell 11SM701-T micro switches, rated at 4 amps 250 vac each, are used. All 3 connections on each switch, Common, N.C. and N.O. are individually wired from the six switches to the 19-pin connector. 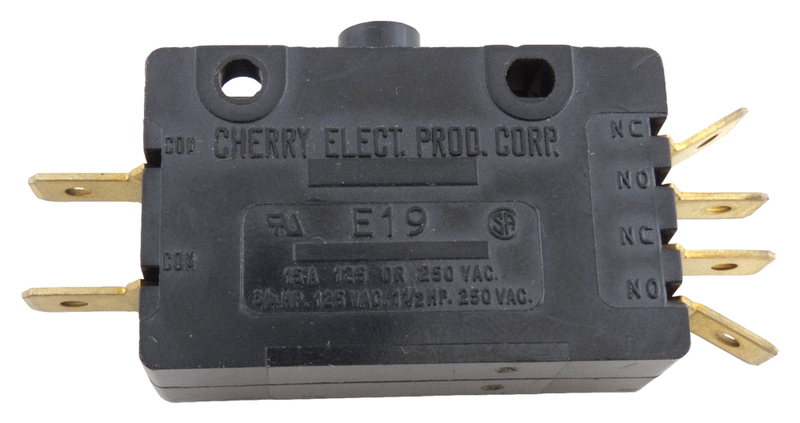 Cherry Electronics micro switch. 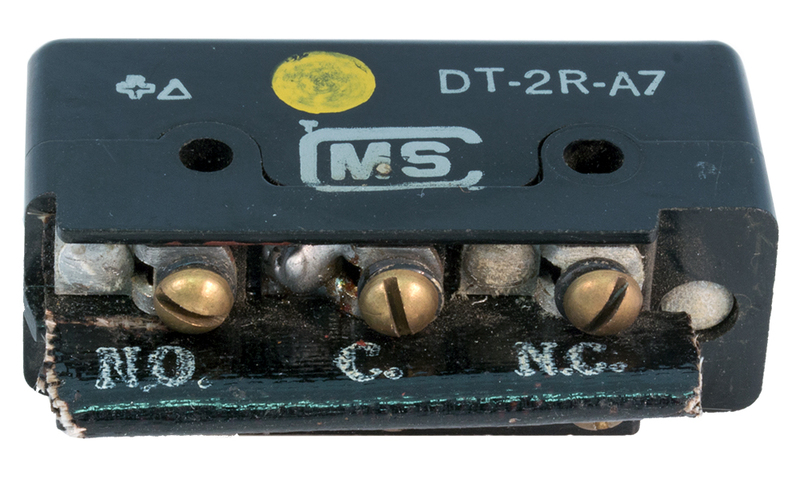 Four (4) SPDT switches in one body. 0.375" c-c on mounting holes. 10.1 amp, 250 vac. 3/8" lever snap action. 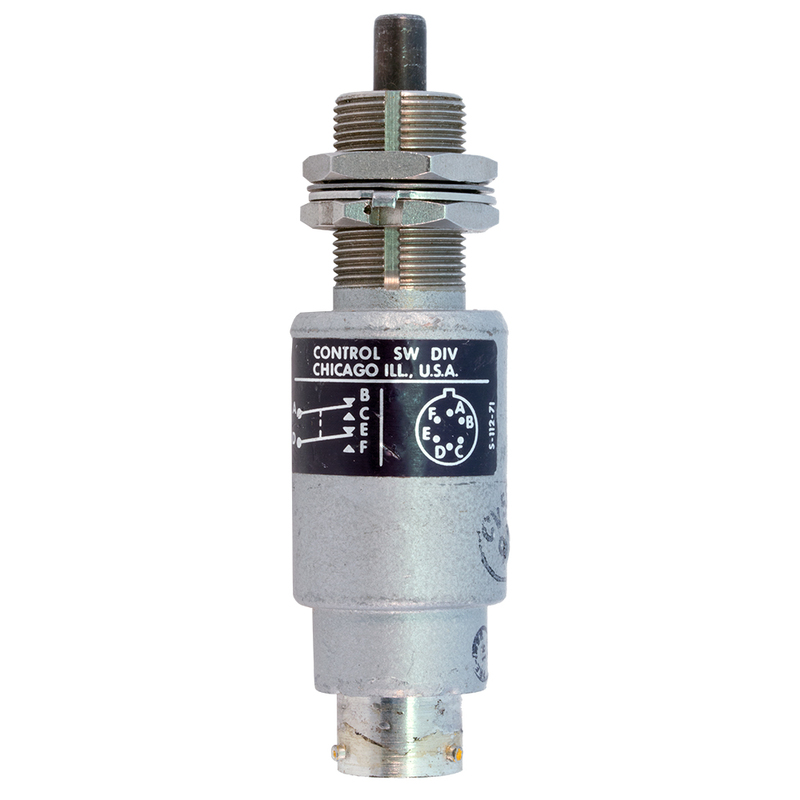 3/4" x 7/8" x 1/2"H.
Honeywell SPDT micro switch. 7 amp contacts. Mounting hole on 3/16" centers. 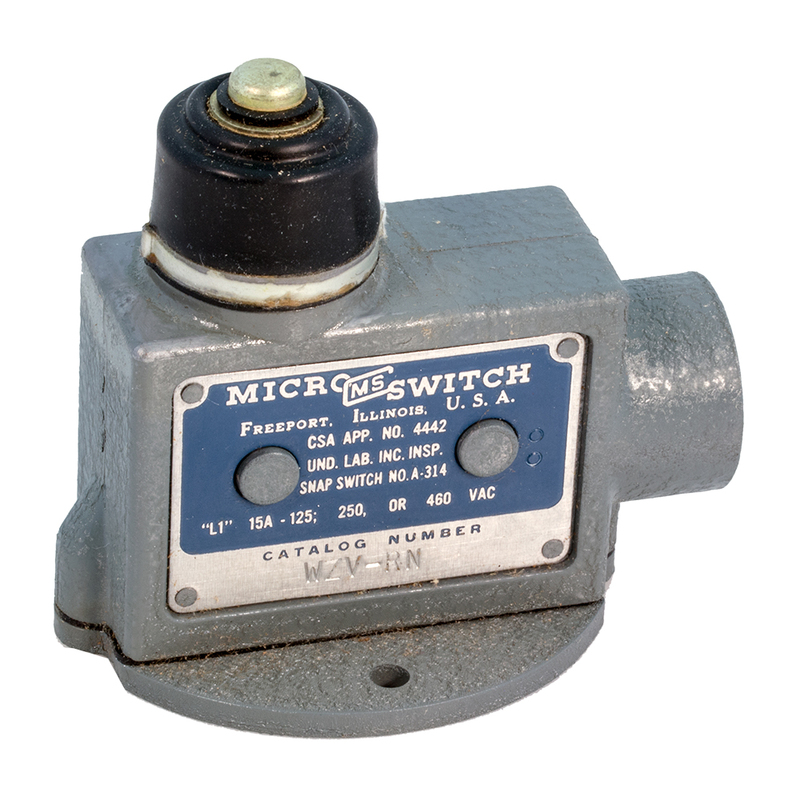 1/2" x 7/32" x 3/8"H. Honeywell P/N: 2SX1-T.
Milli-Switch micro switch. Turret terminals. 1/4" x 3/4" x 3/8" high. 3/8" c-c mounting holes. 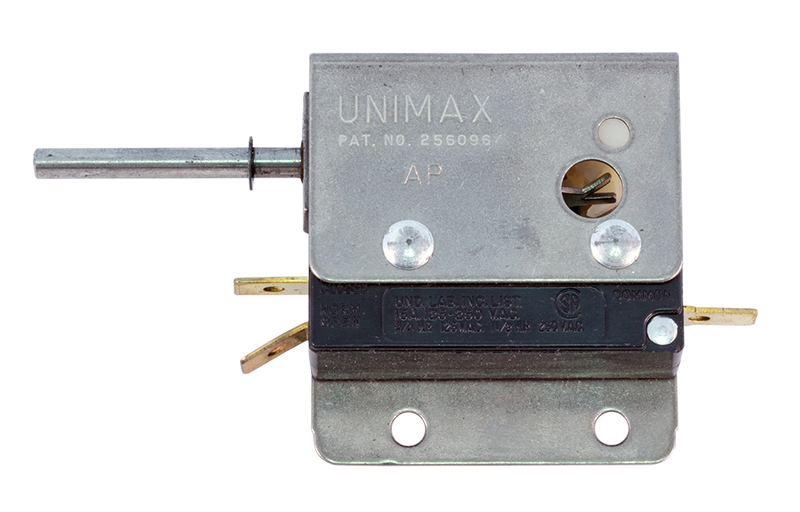 Unimax micro switch. SPDT. 5 amp, 125, 250 vac. 1/4" x 3/4" x 3/8" high. 3/8" c-c mounting holes. 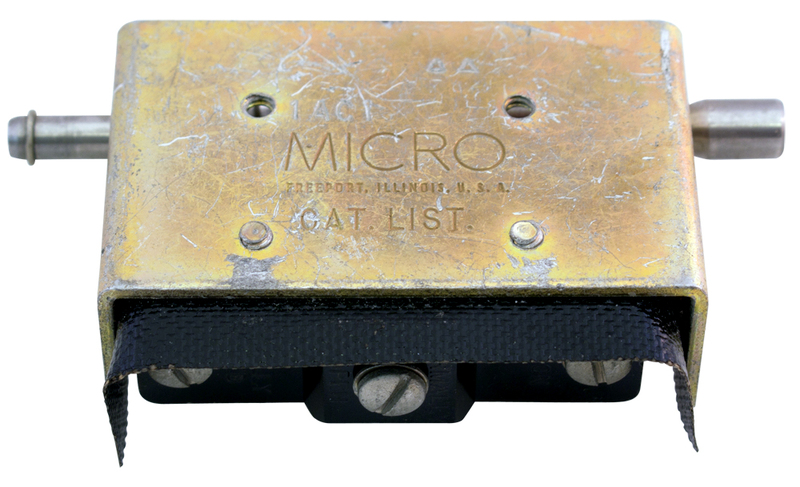 Micro snap switch. SPDT. 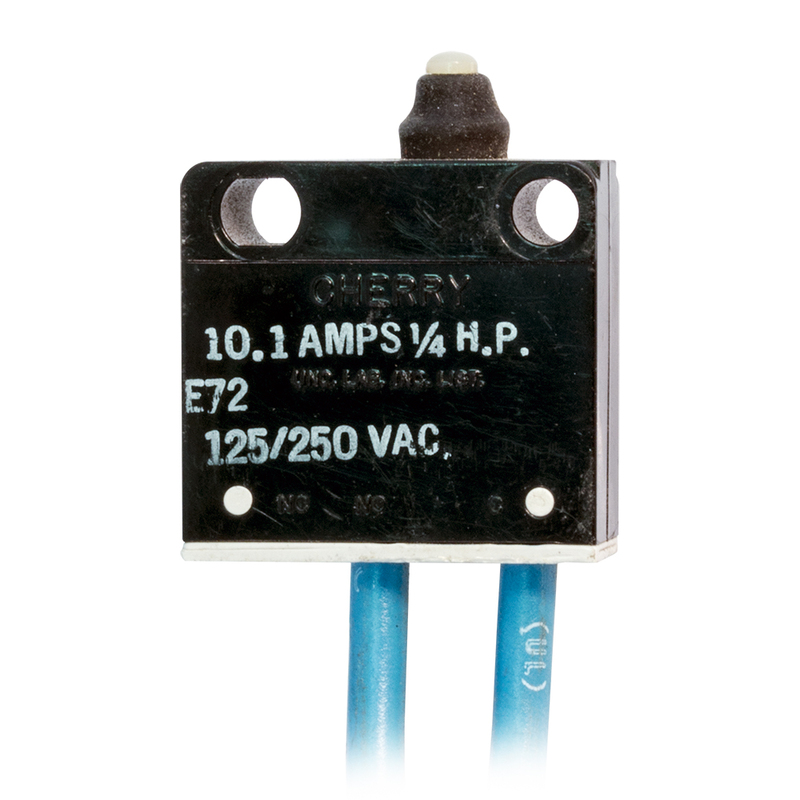 125 - 250v AC, 4 amp. Soft touch on action. 1" c-c mounting holes. UL CSA listed. Cherry Micro switch. SPST normally open 5 amp 125 / 250v contacts. Quick disconnect terminals. 1" center to center between mounting holes. 3,000 available. Cherry micro switch. 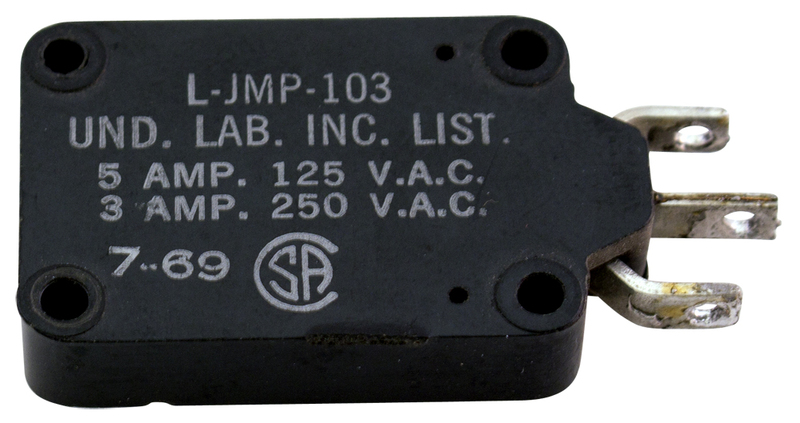 SPDT 0.1 amp contacts. Quick disconnect terminals. 1" center to center between mounting holes. Cherry micro switch. SPST, normally open. 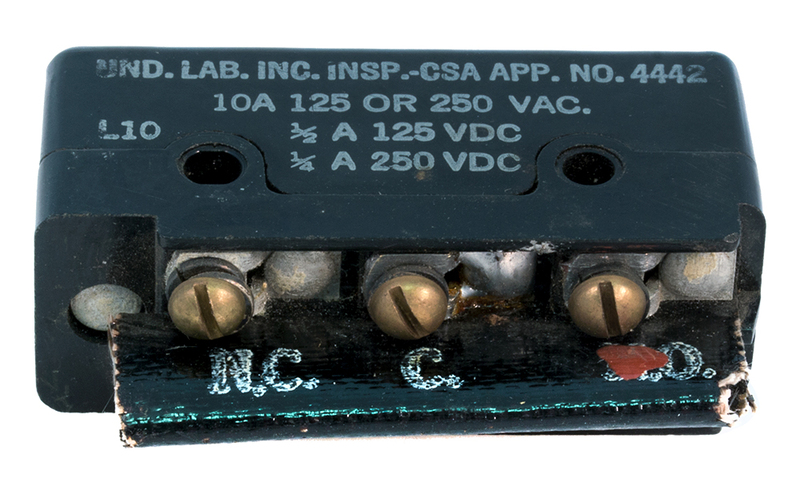 125 - 250 vac, 5 amp. 0.95" c-c mounting holes. 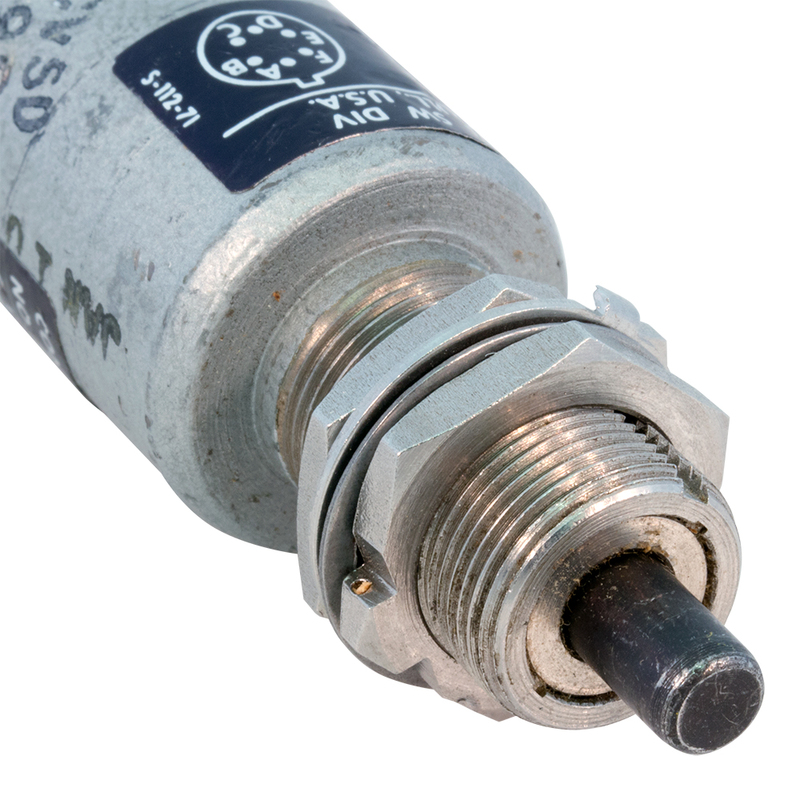 Unthreaded solder-only terminals. 1-1/8" x 5/8" x 3/8" thick. Cherry micro switch. SPST, normally open. 125 - 250 vac, 3 amp. 0.95" c-c mounting holes. 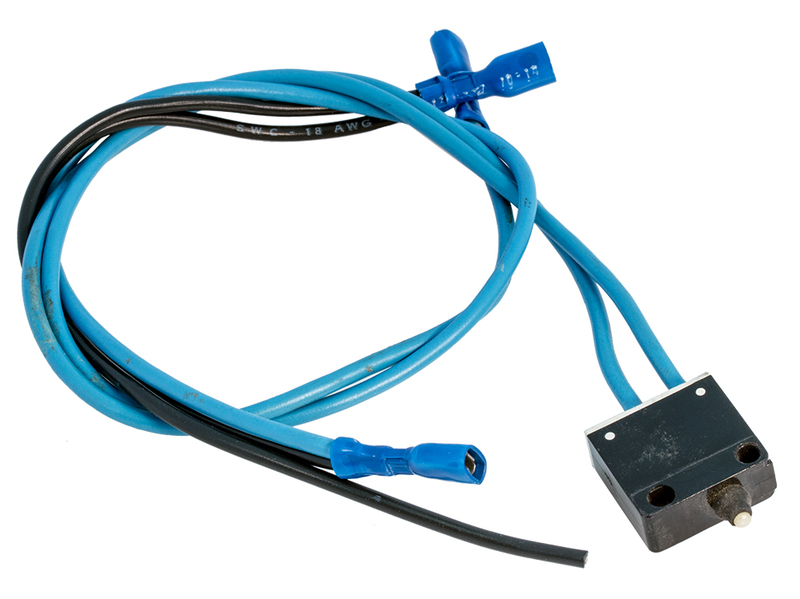 Quick connect or solder terminals. 1-1/8" x 5/8" x 3/8" thick. 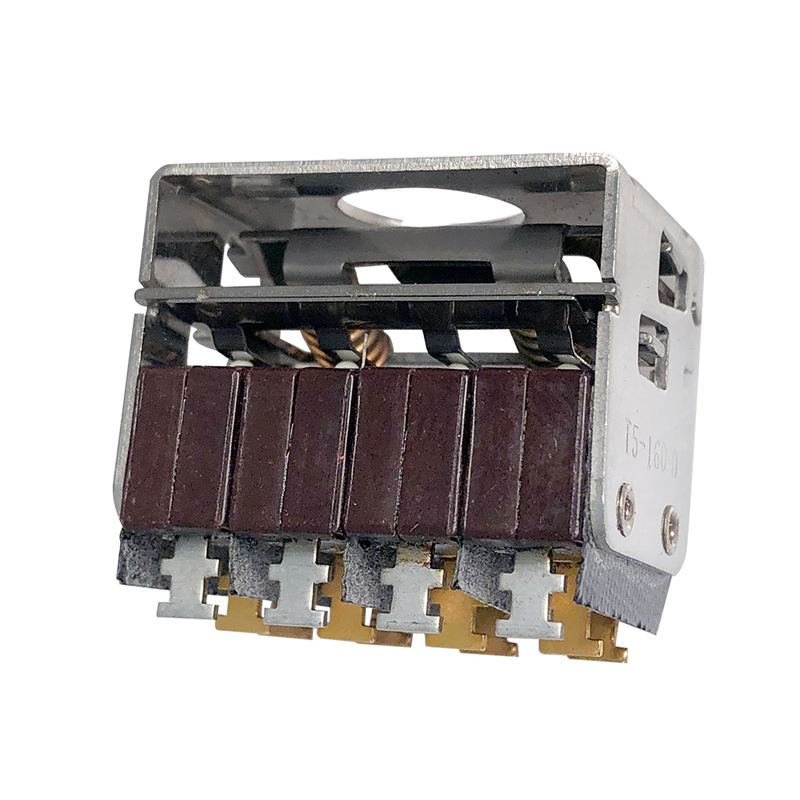 Licon mini micro switch. PC mount. SPST, normally open. 0.375" c-c mounting centers. NSN: 5930-239-2132. G.E. micro switch. 2 poles, normally open & normally closed. 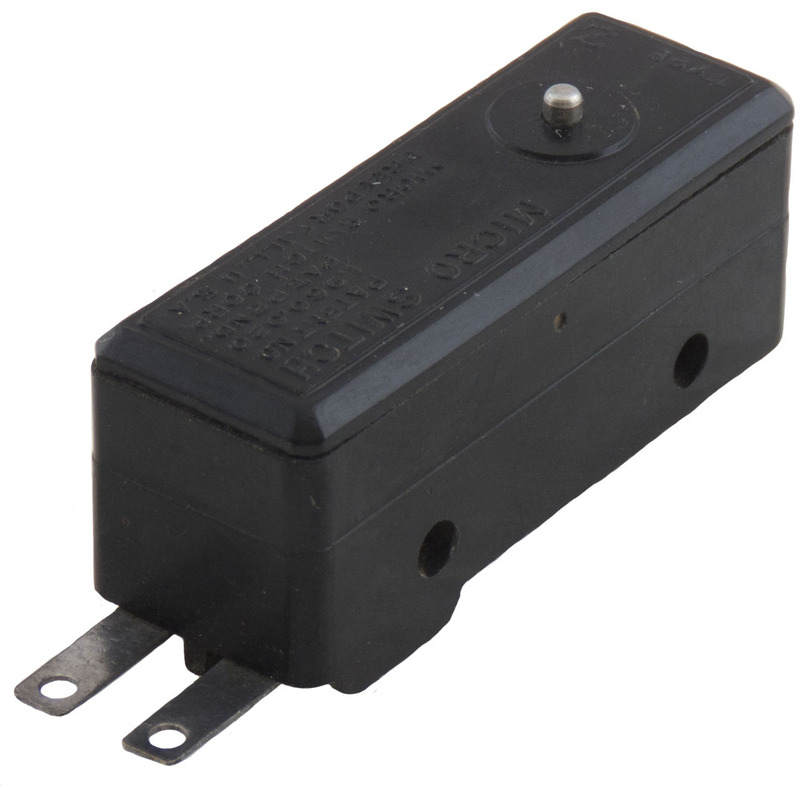 Rated DC to 600vAC, 40 amp make / 15 amp break. 2-1/2" x 7/8" x 1" deep. 2-1/8" c-c mount holes. NSN: 5999-01-117-8012.